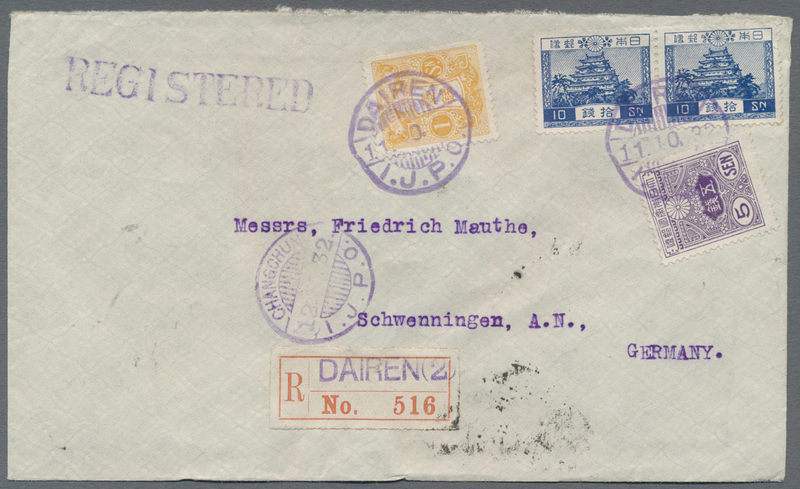 9336 Ganzsache (Complete) H&G 5, SG 30 1928 Postal stationery card 2c. 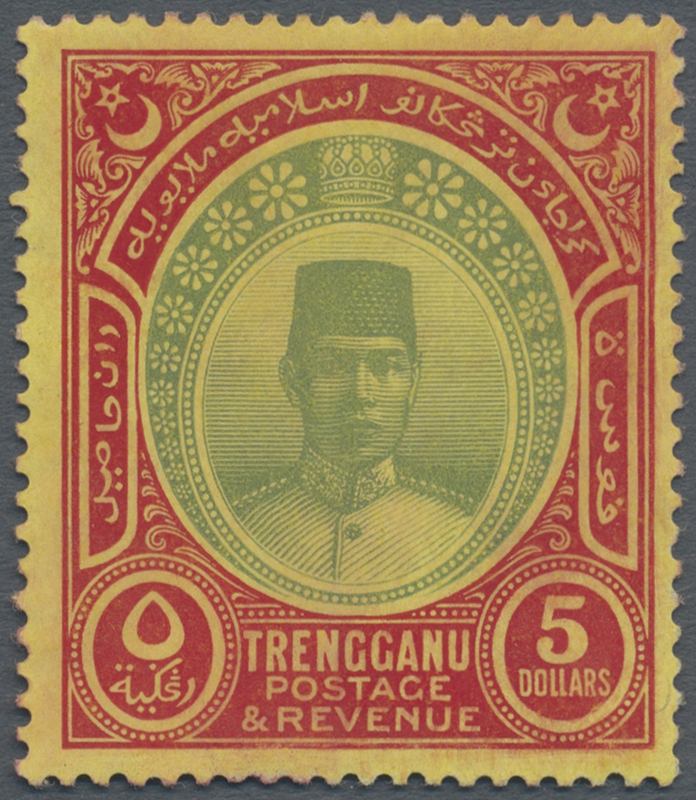 green, uprated by similar Sultan Suleiman definitive 4c. 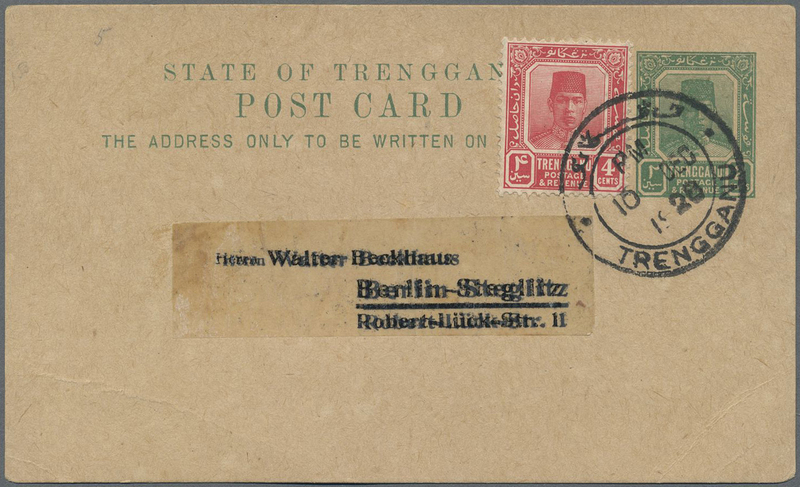 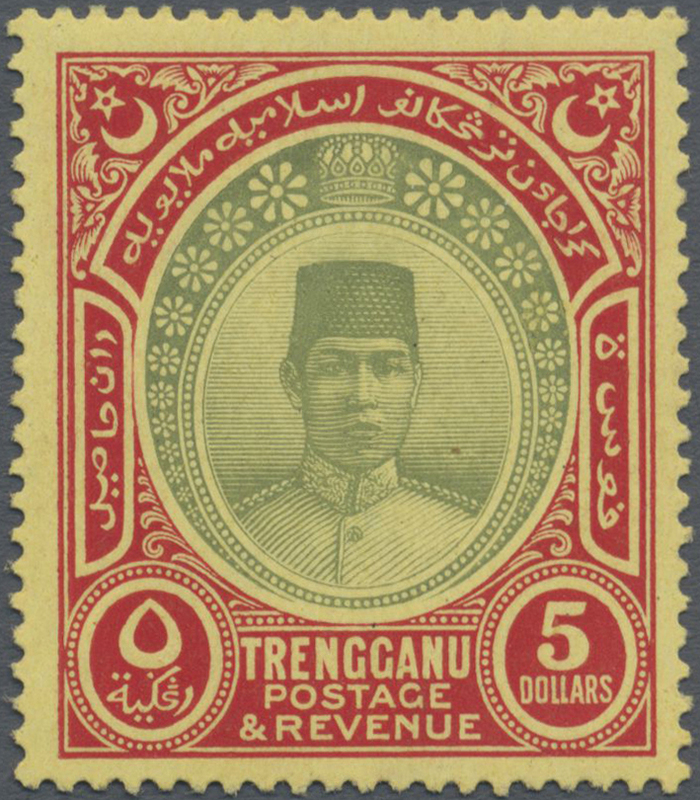 carmine, cancelled by Kuala Trengganu '10 DEC 1928' double-ring d/s with top inscription in Jawi (Proud D3), and addressed to Germany, fine. 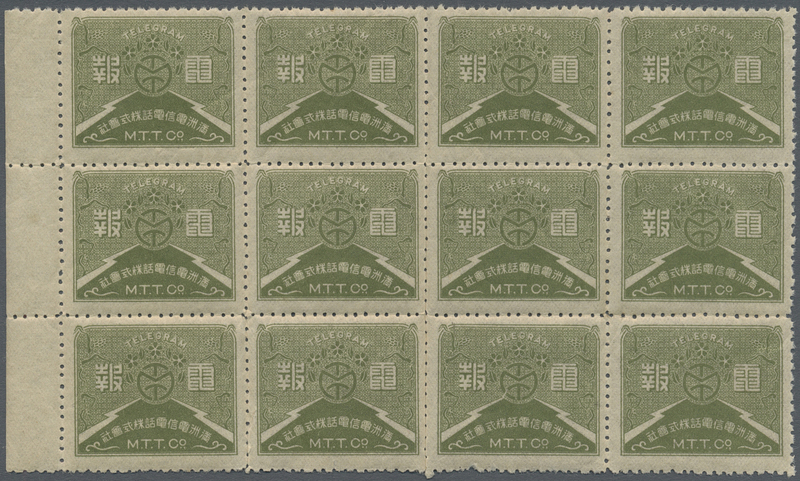 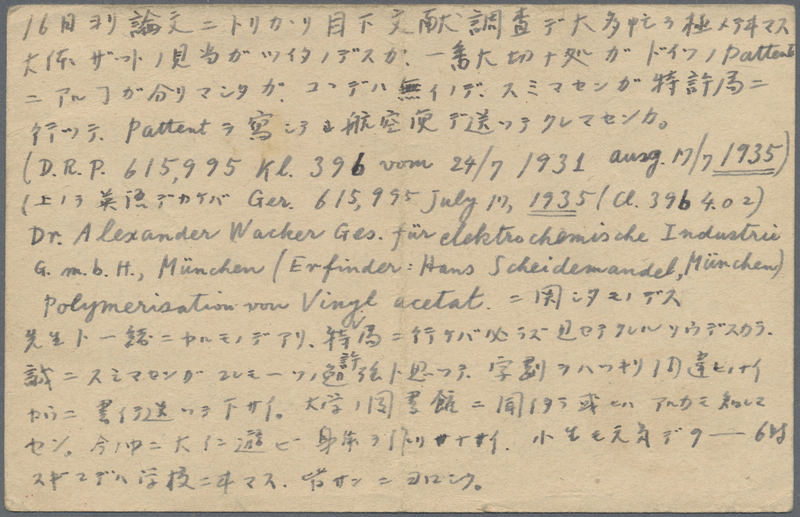 9339 ungebraucht (hinged) * gestempelt (marked) SG JD17/20-ex Japanese Occupation, 1942, small seals on dues, mint and used on stock card, mint 8 C. and used 10 C. slight faults (SG cat. 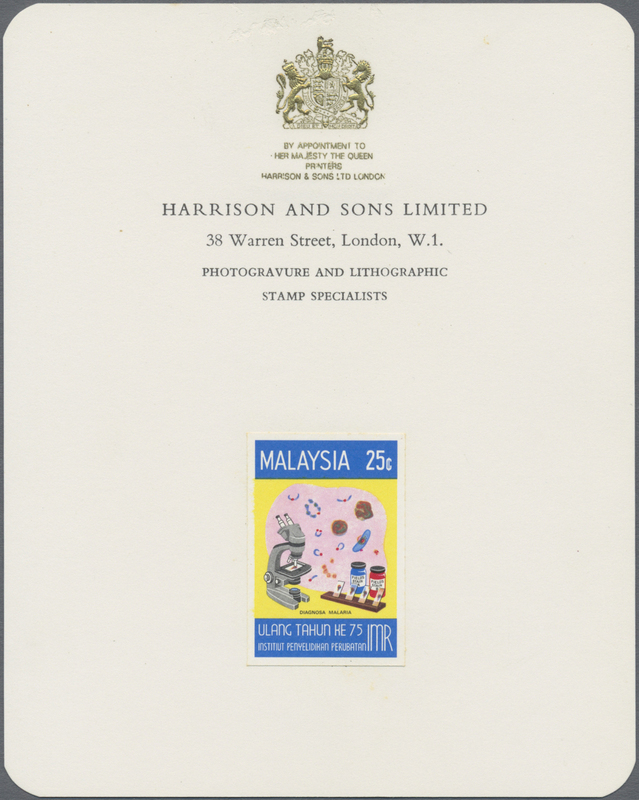 £677). 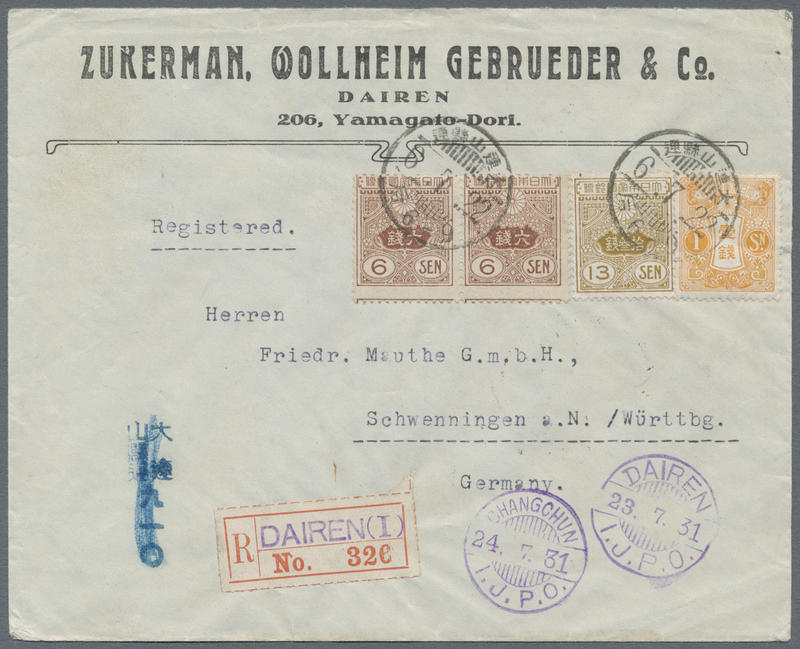 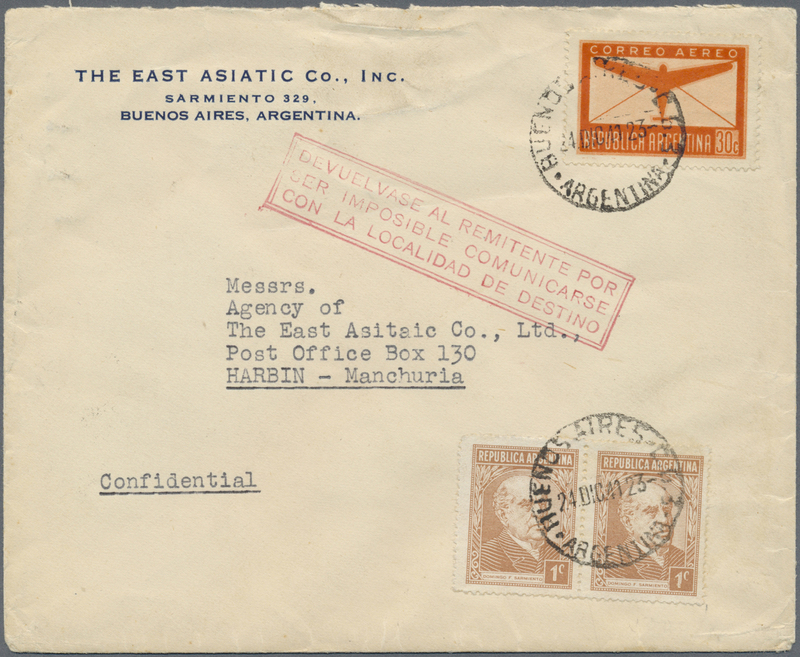 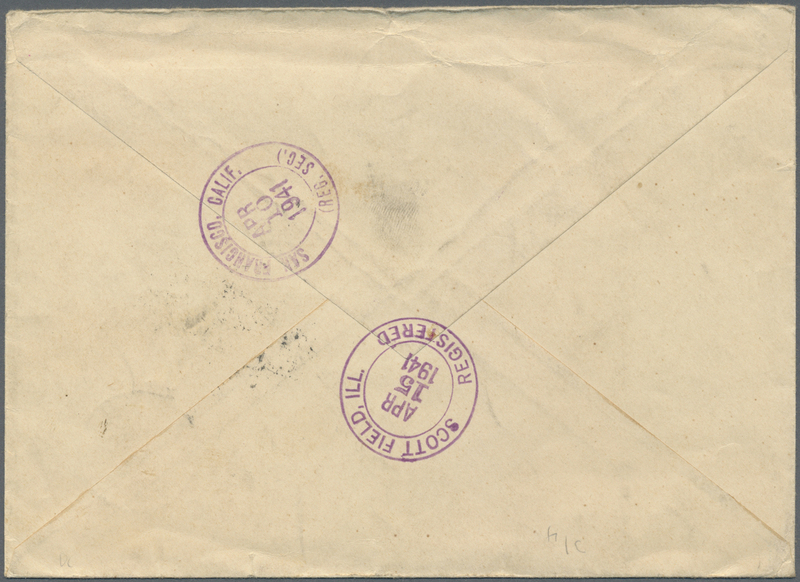 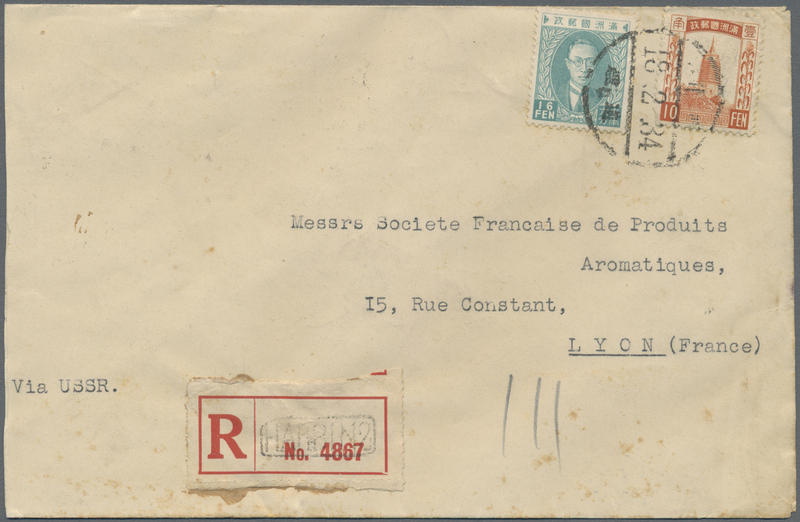 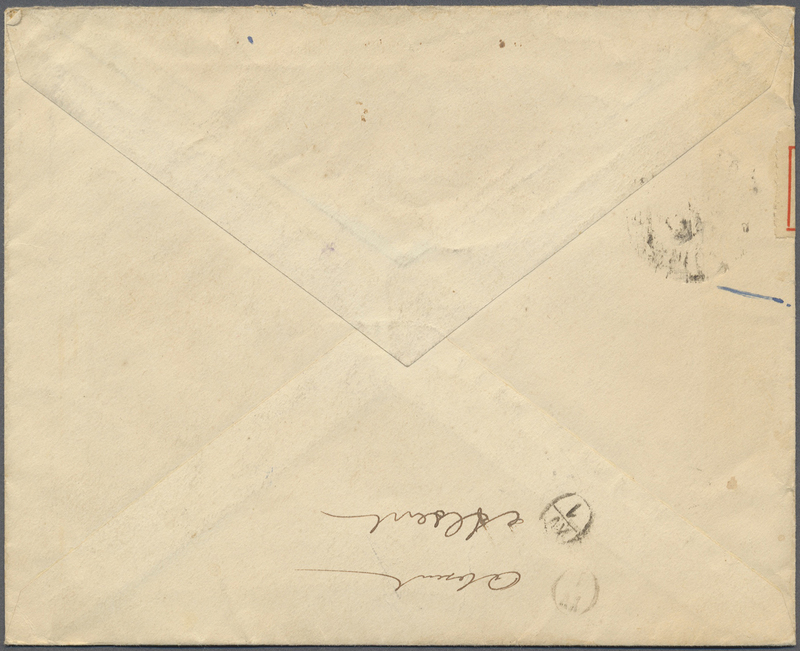 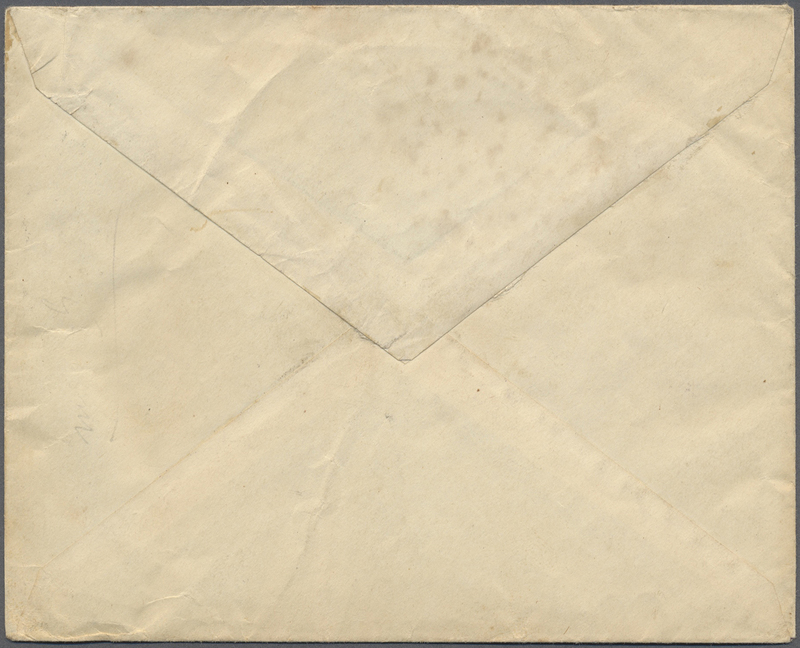 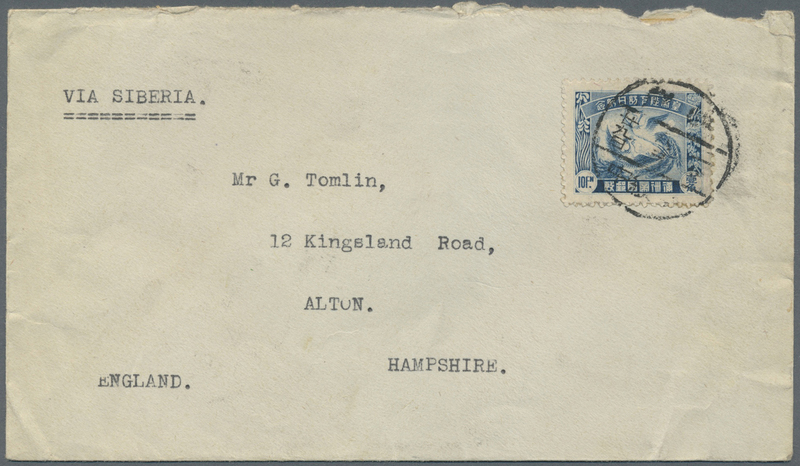 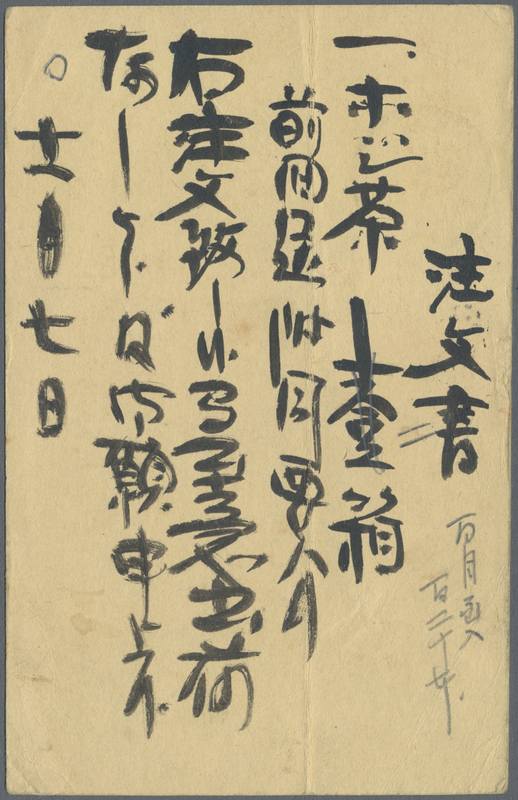 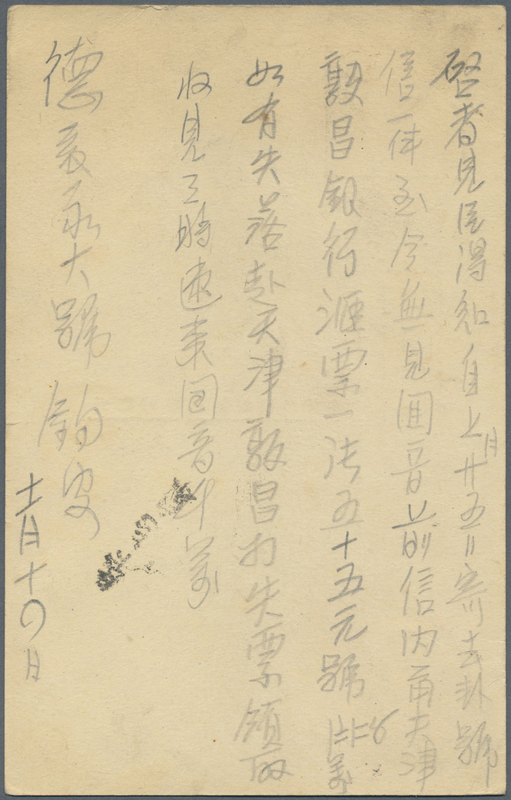 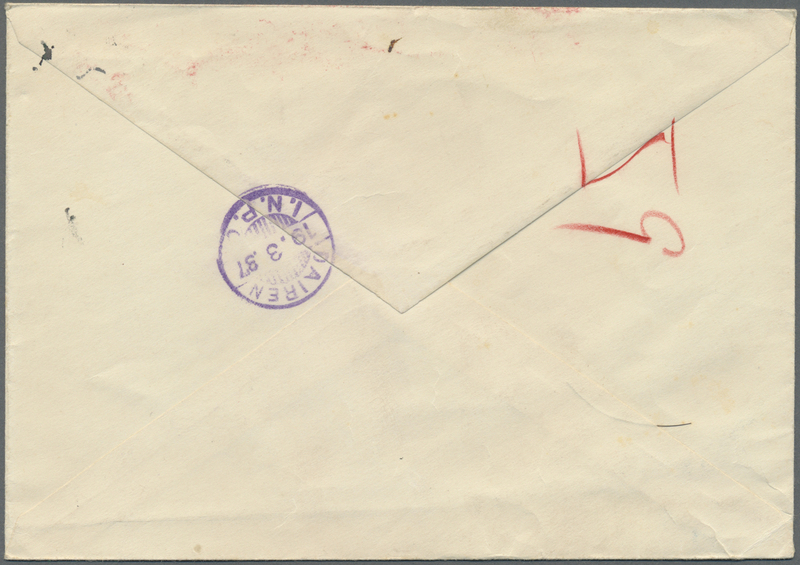 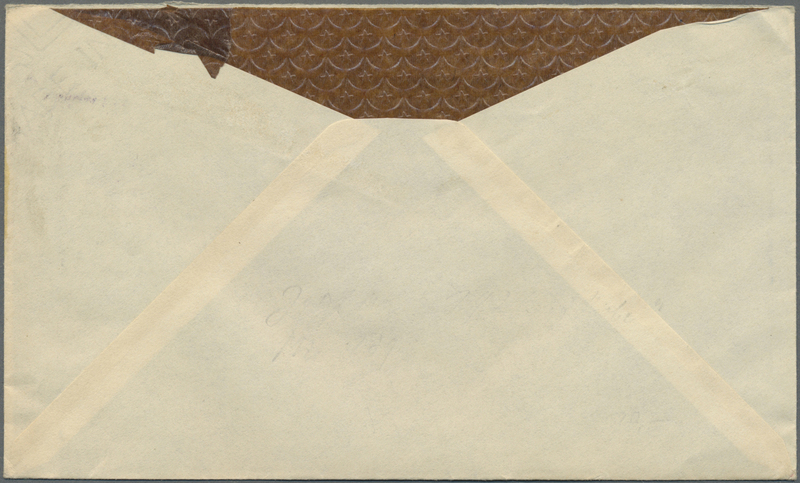 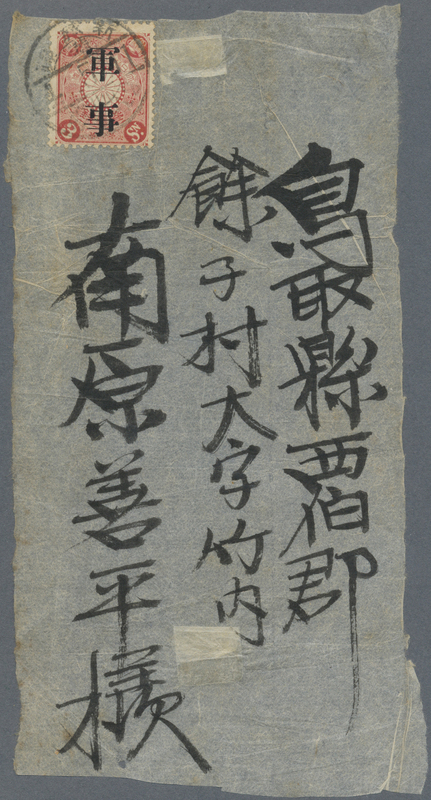 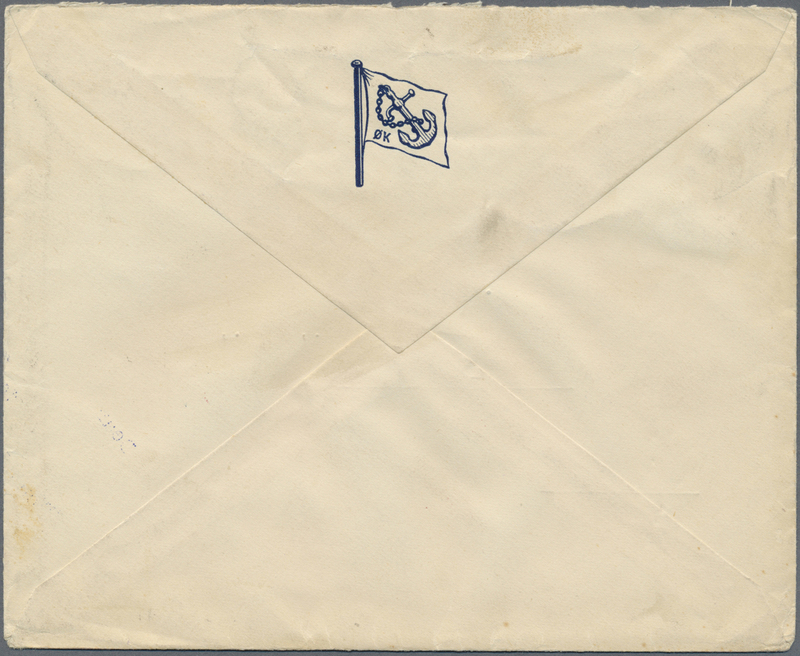 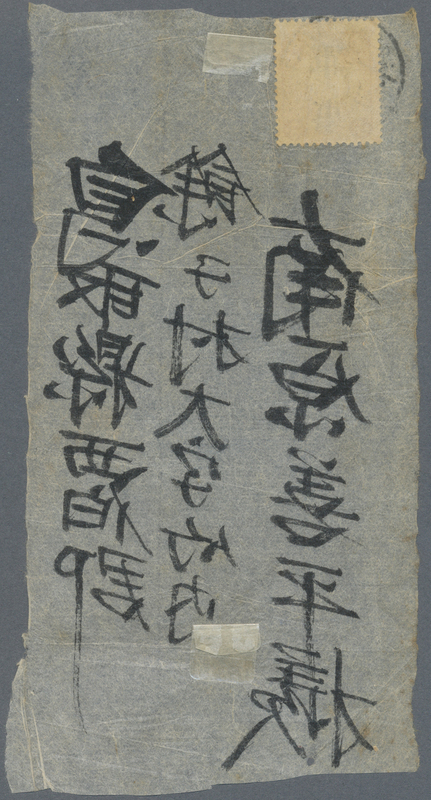 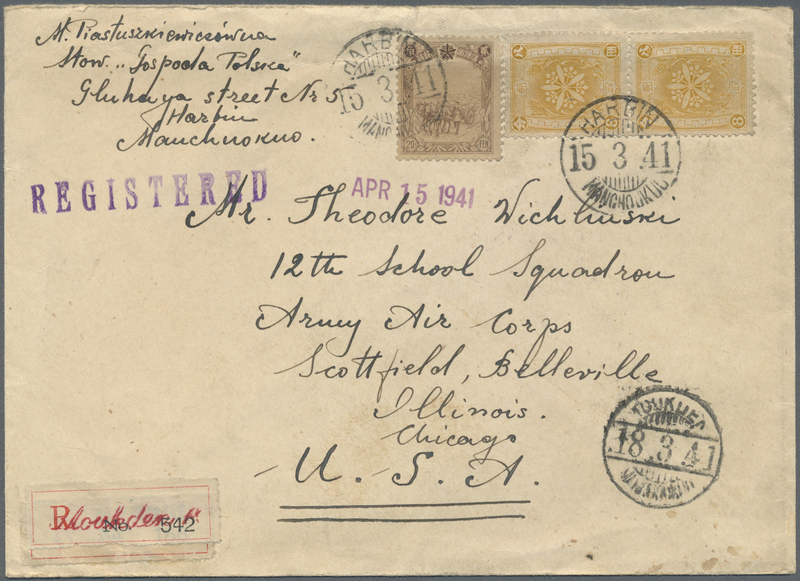 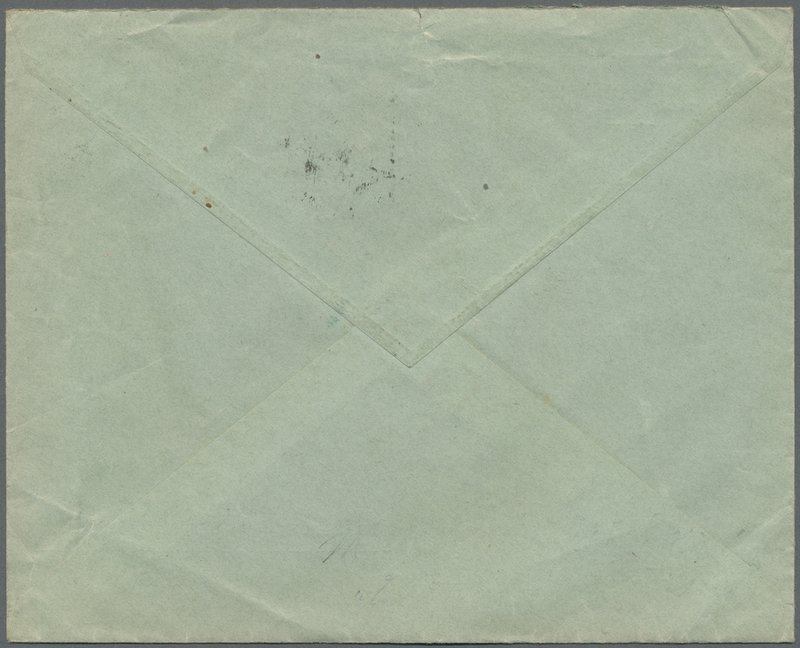 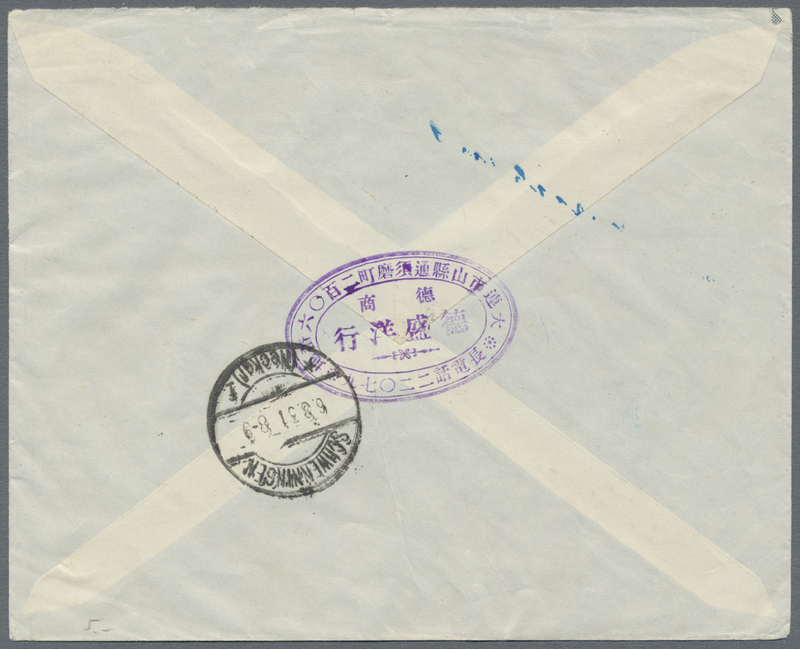 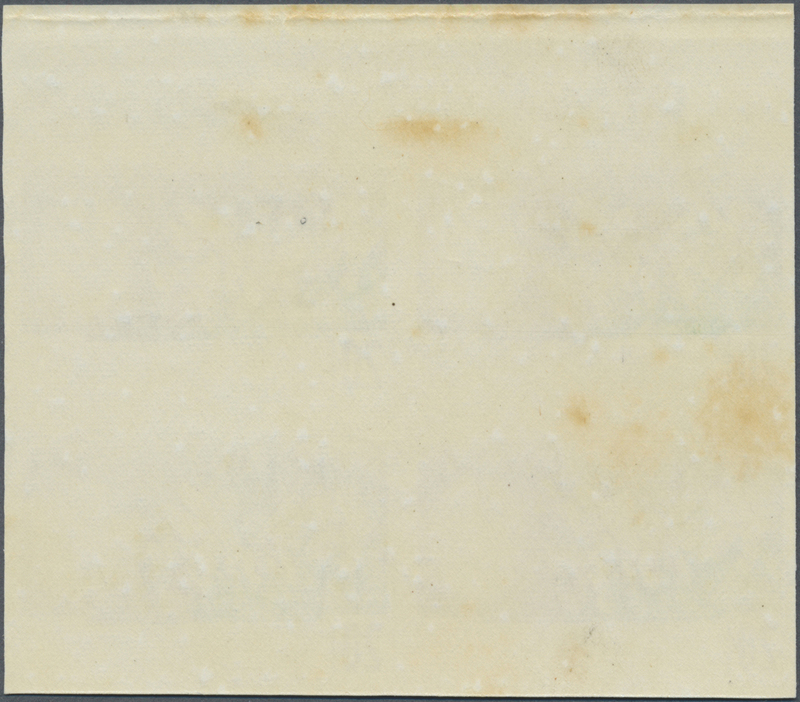 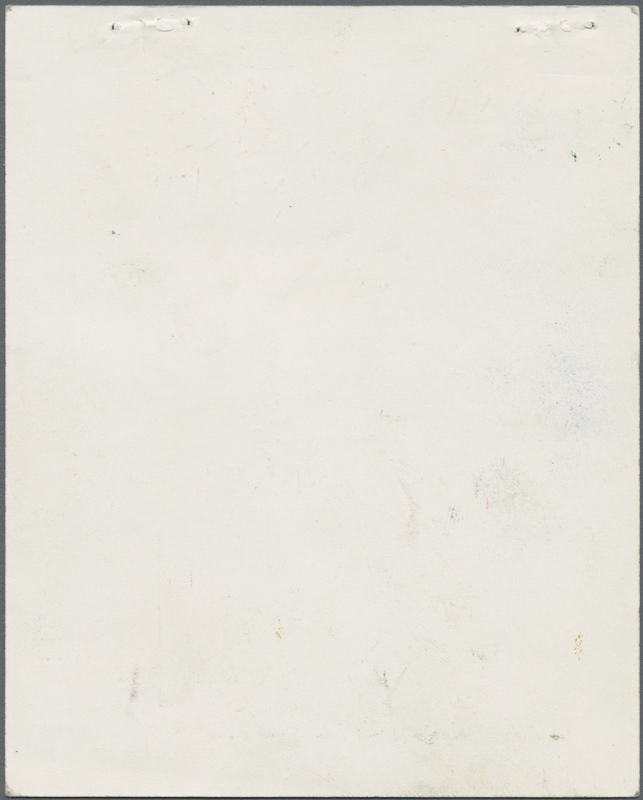 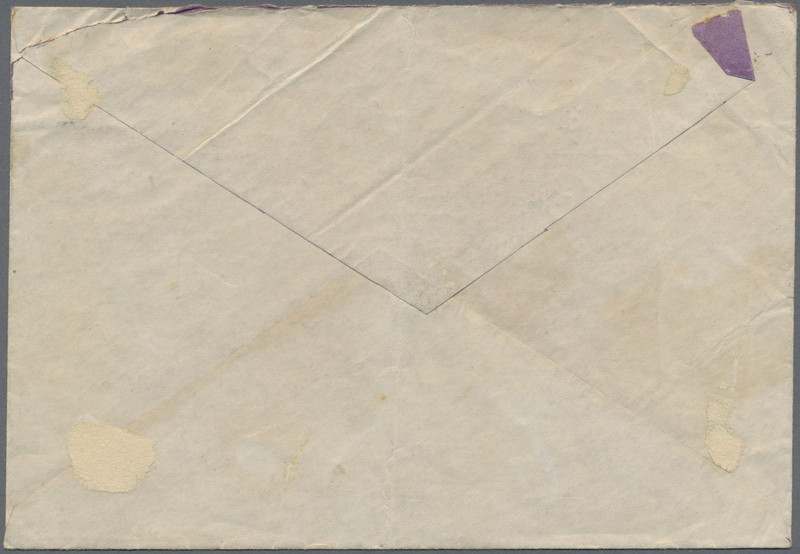 9342 Brief (cover) SG 64-71 a.o. 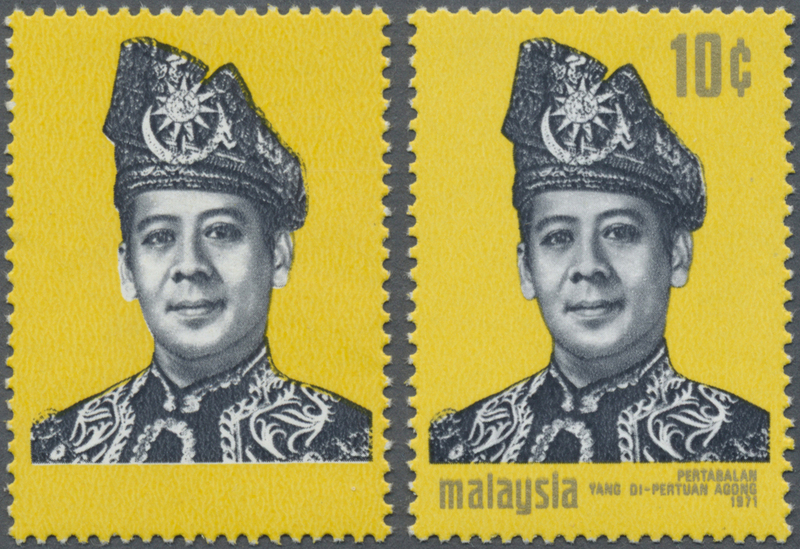 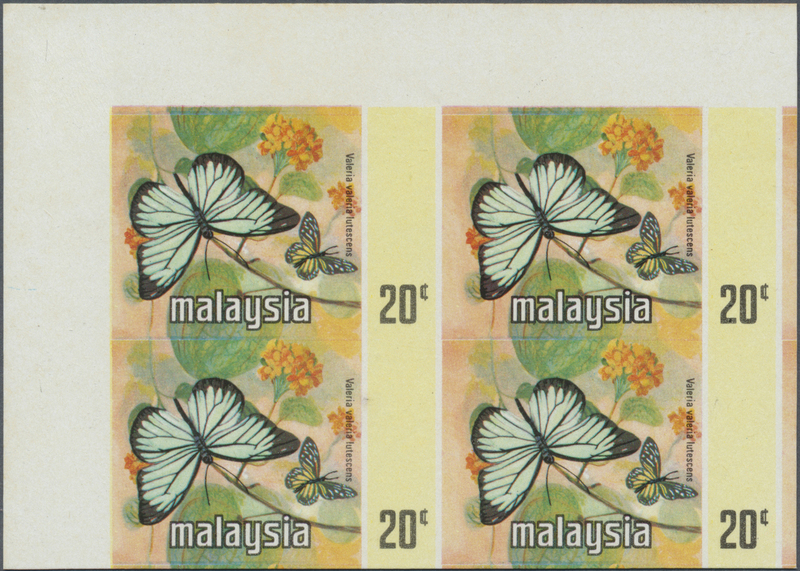 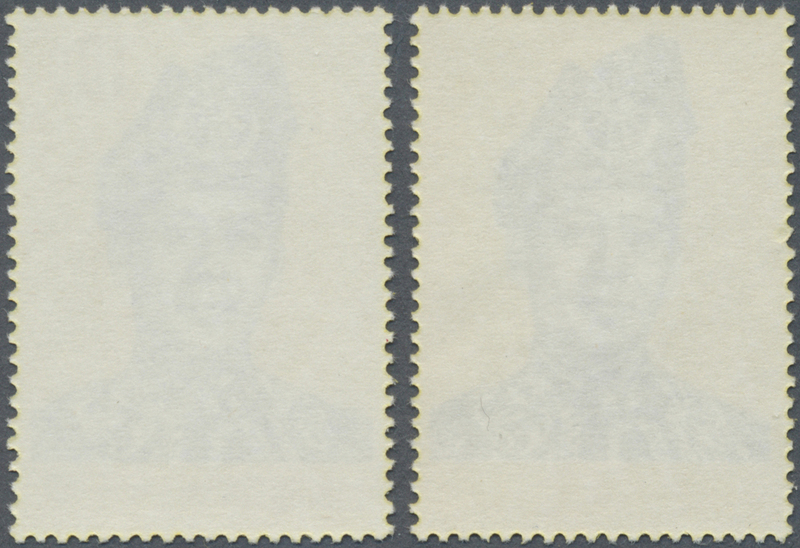 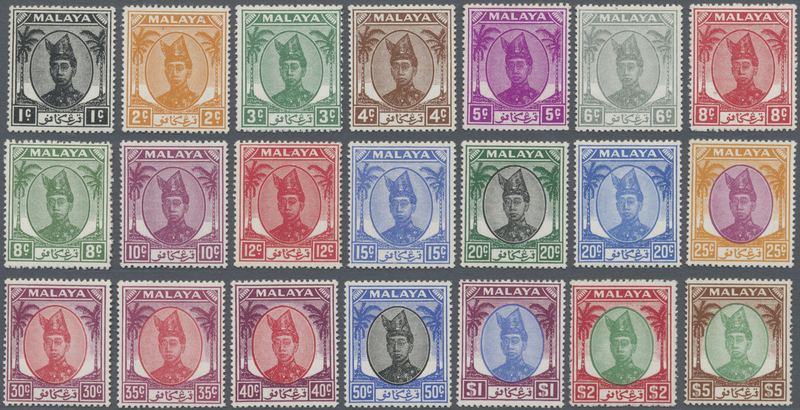 1970 'Butterflies' complete set up to $10 used on registered express cover from Kulim to Singapore in 1983, additionally franked by two pairs of Kedah 'Butterflies' 1c. 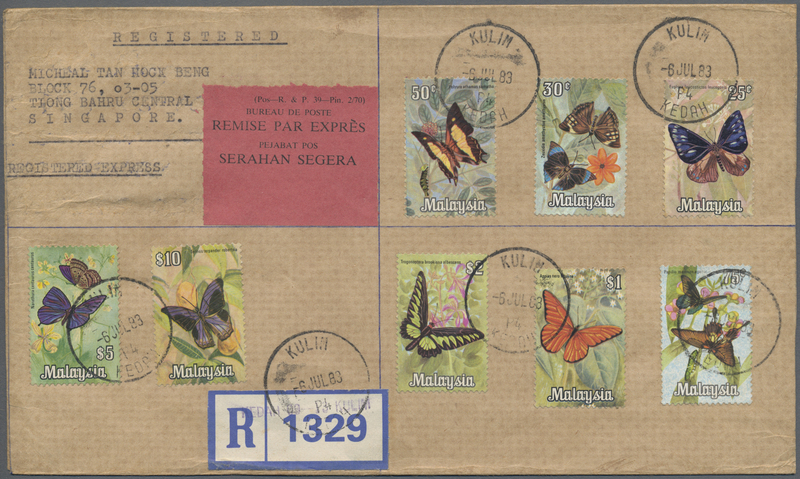 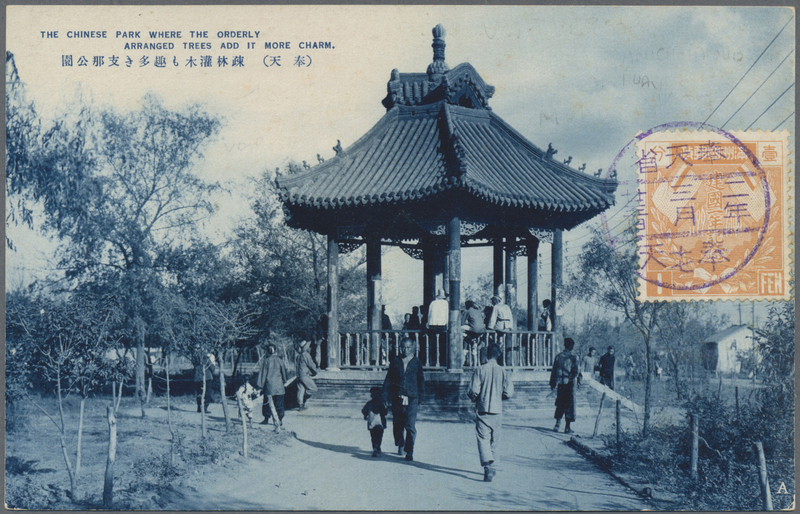 on the reverse, all tied by Kulim '6 JUL 83' cds, Reg. 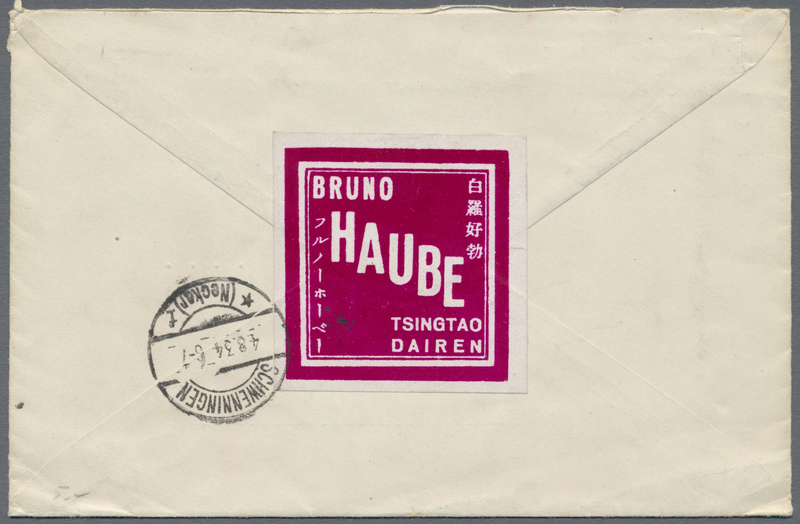 and Express labels on face, Penang transit dater and Tjong Bahru arrival cds on back, fine. 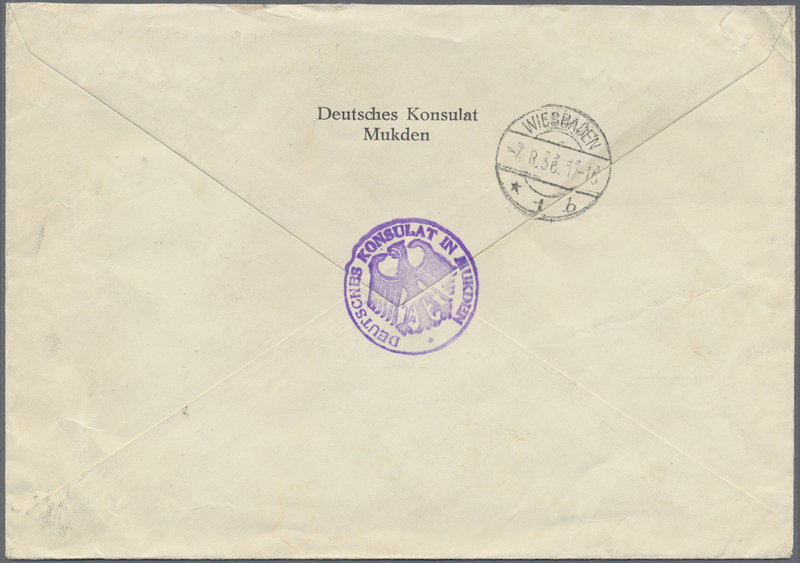 9343 4er (Block) postfrisch (never hinged) ** 67 var. 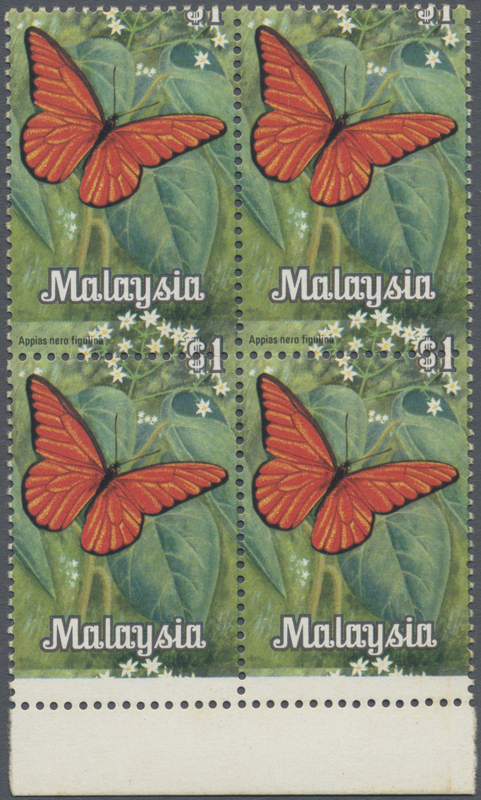 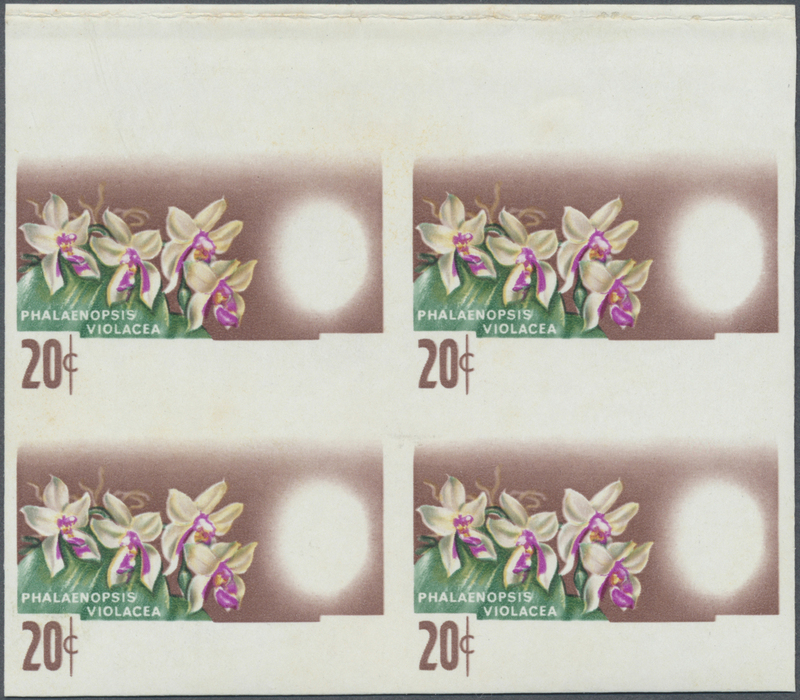 1970 Butterflies $1 bottom marginal block of 4 showing PERFORATION MISPLACED (shifted downwards more than 2mm), mint never hinged, lightly stained, fine appearance. 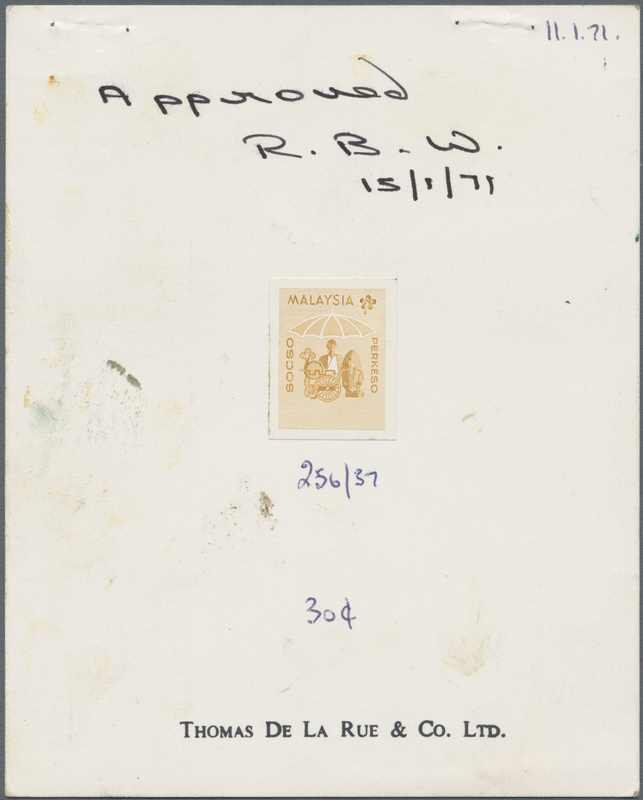 9346 ungebraucht ohne Gummi (unused without gum) (*) Barfoot (3) Essay 1971 Essay of the Malaysia Social Security stamp 30c. 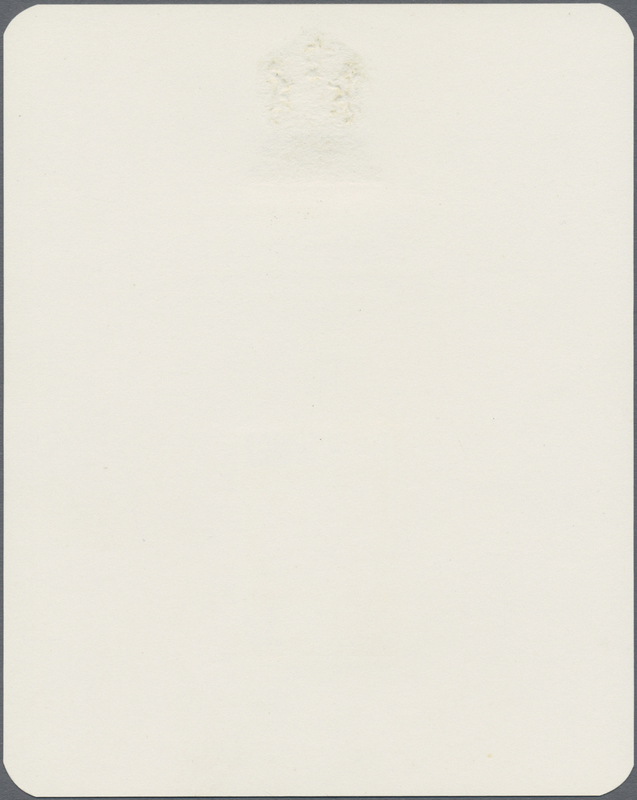 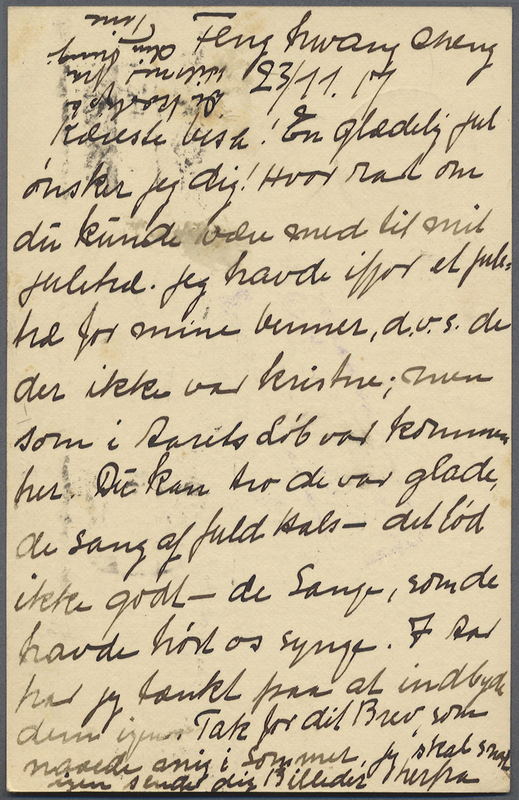 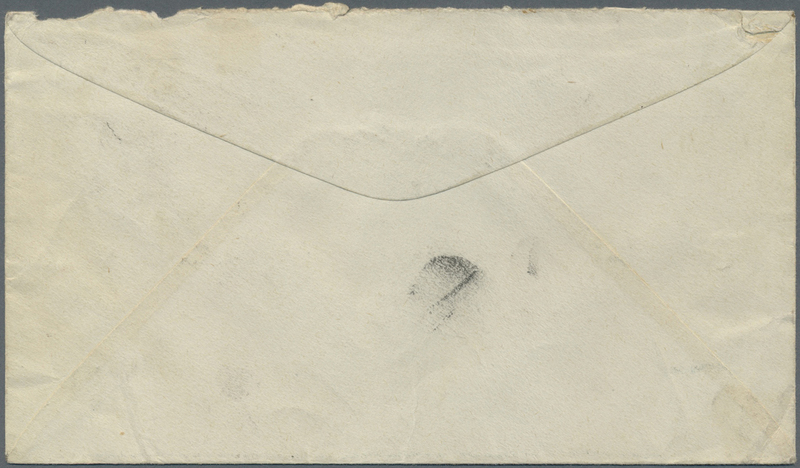 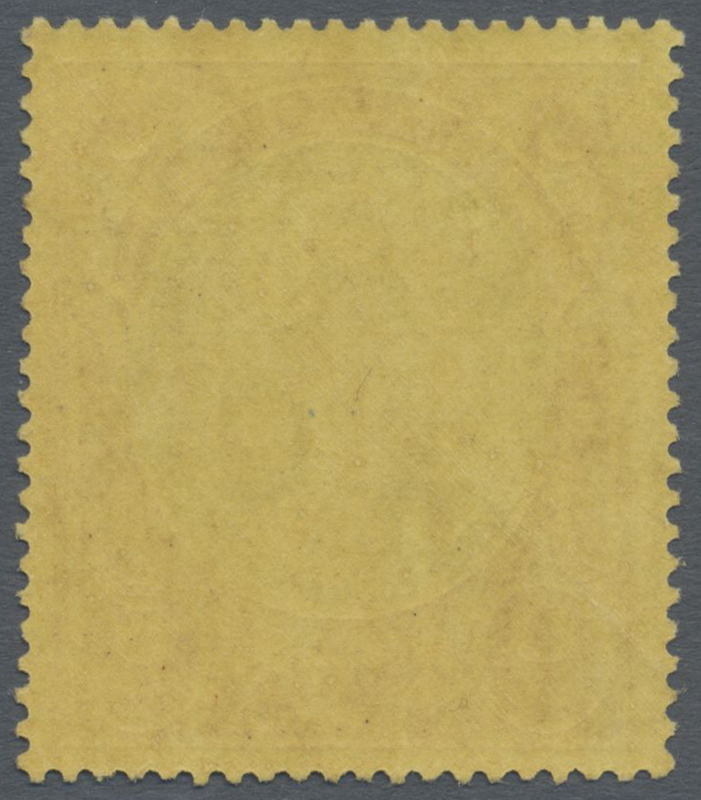 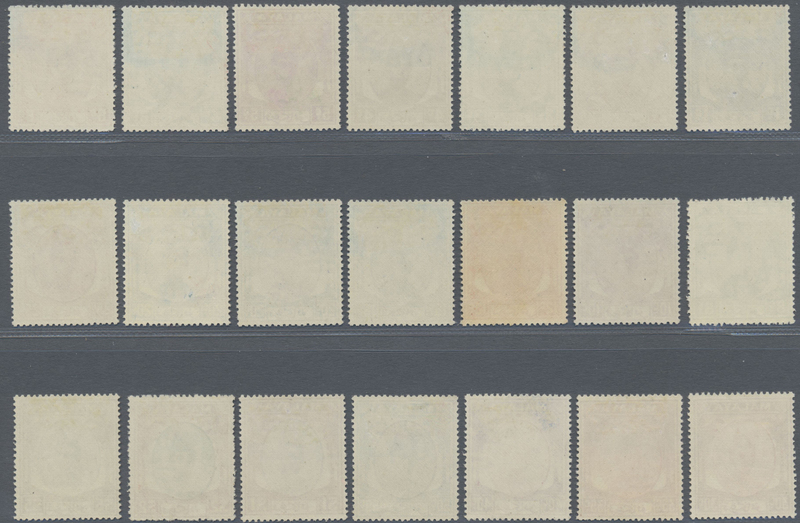 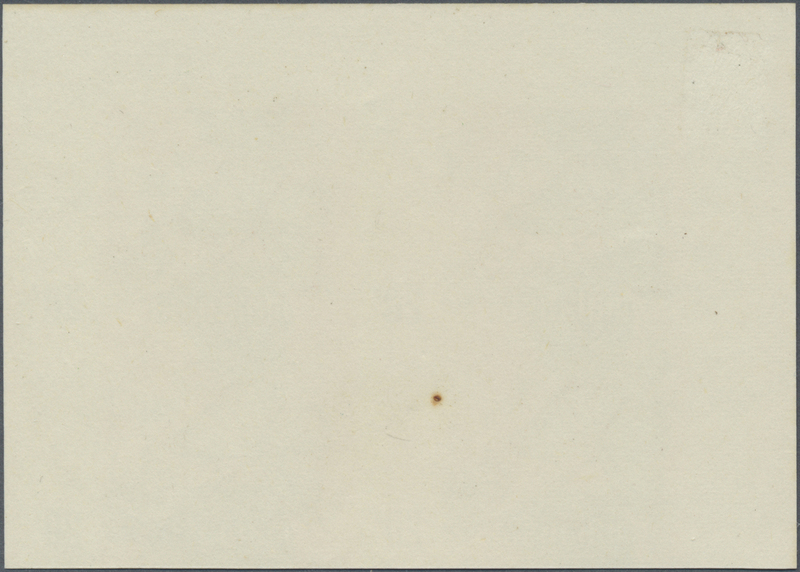 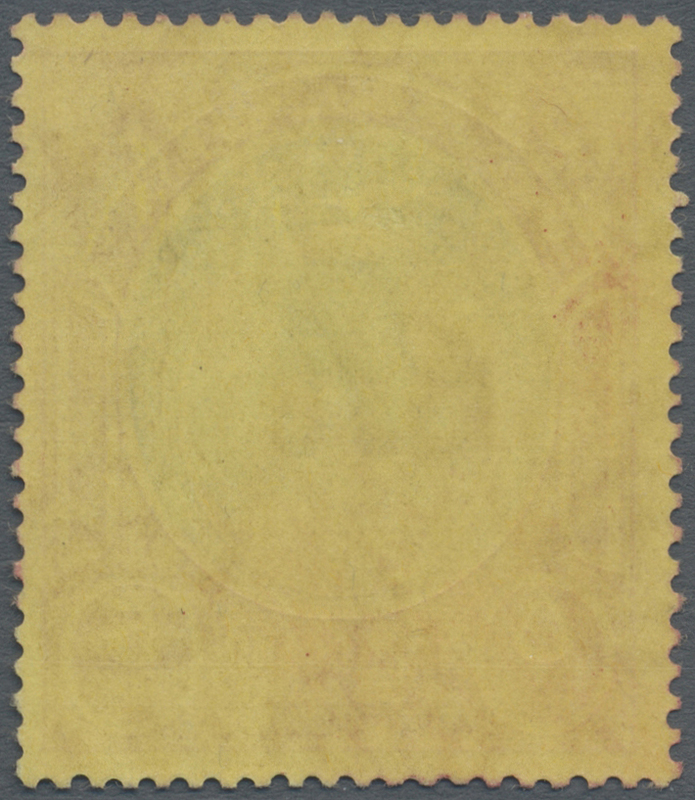 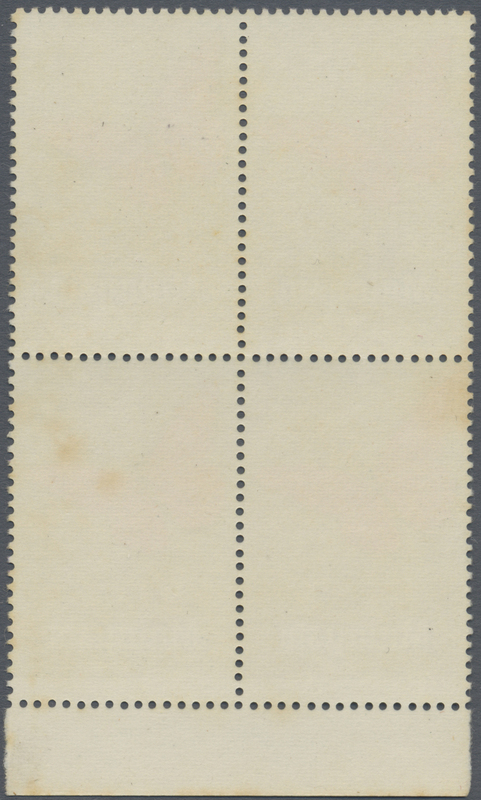 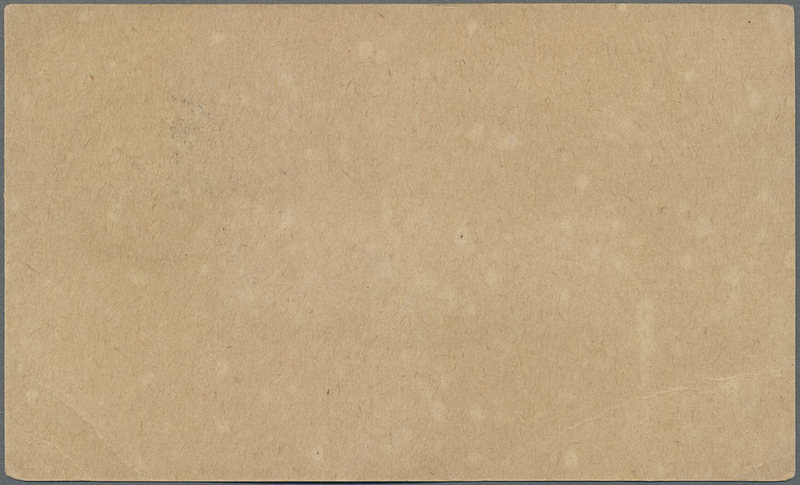 yellow-brown, without value, imperforated, mounted on white Thomas De La Rue card, noted "256/37", "30c" and "Approved R.B.W. 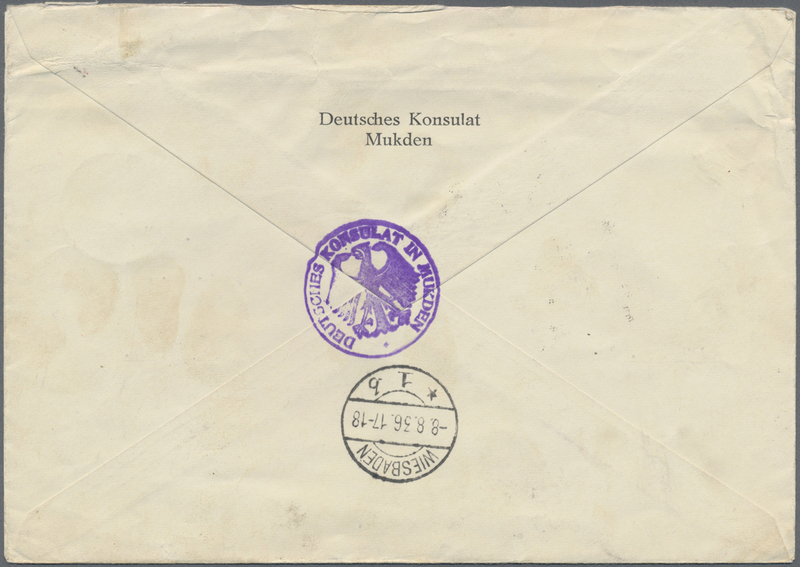 15/1/71" in m/s. 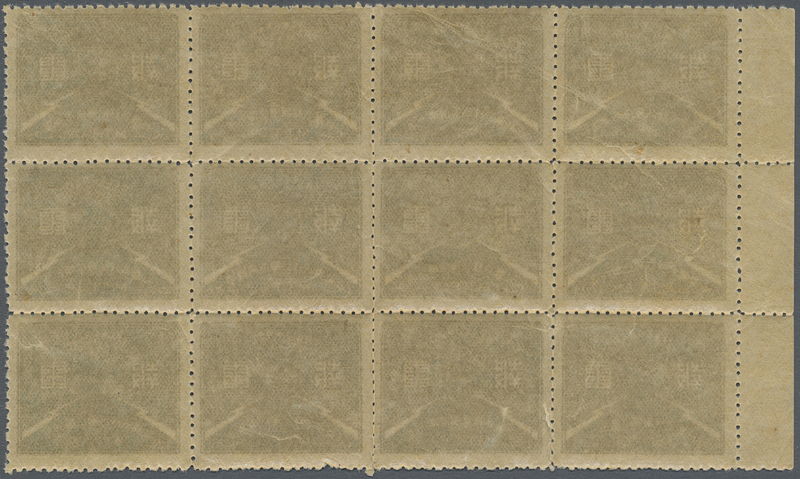 9347 ungebraucht ohne Gummi (unused without gum) (*) (146) Proof 1976 DIE PROOF of 'Malaria diagnosis' 25c., IMPERFORATED on Harrison & Sons card, fresh and fine. 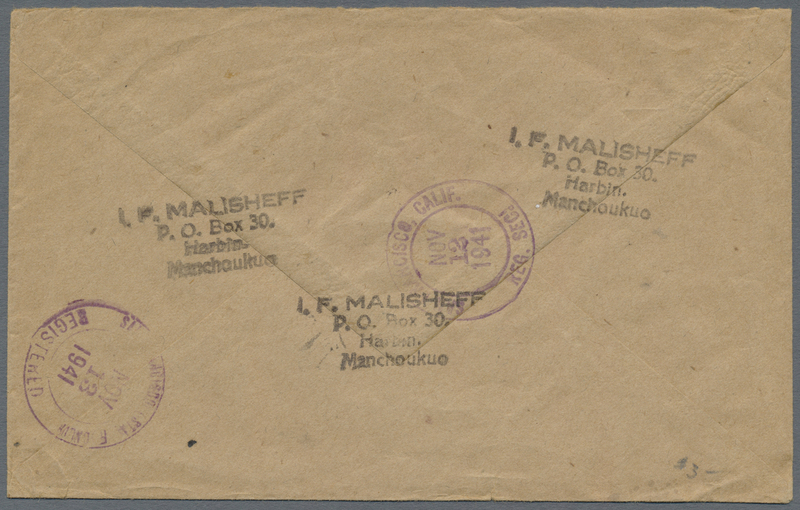 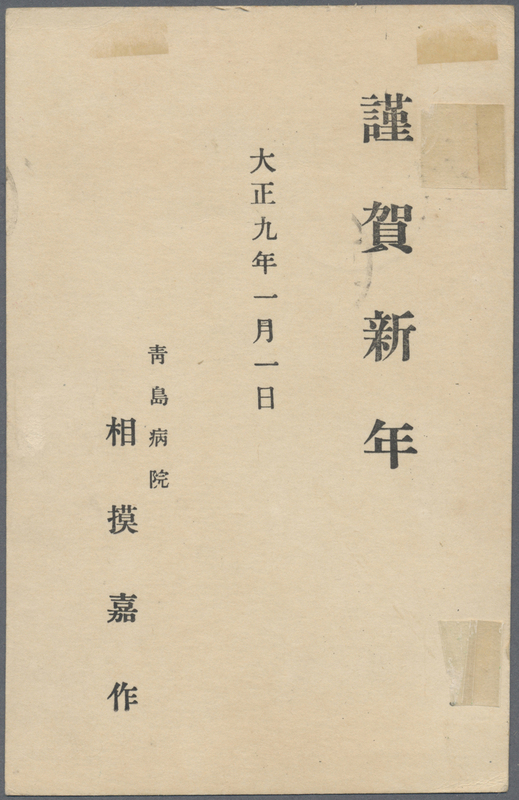 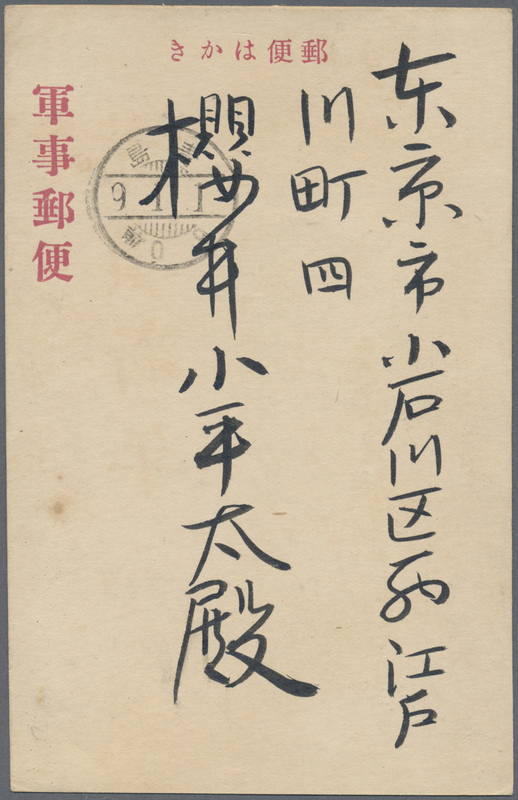 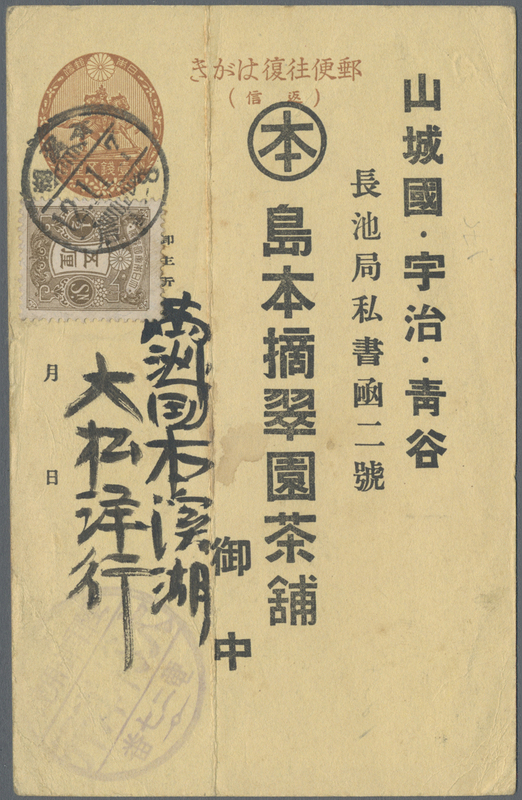 9356 Brief (cover) 1932, "ki-hei" ovpt. 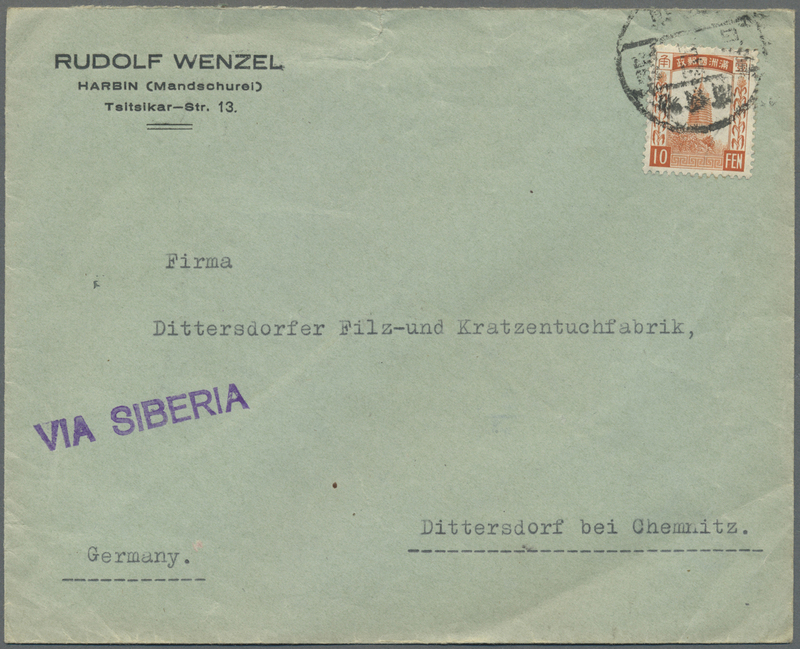 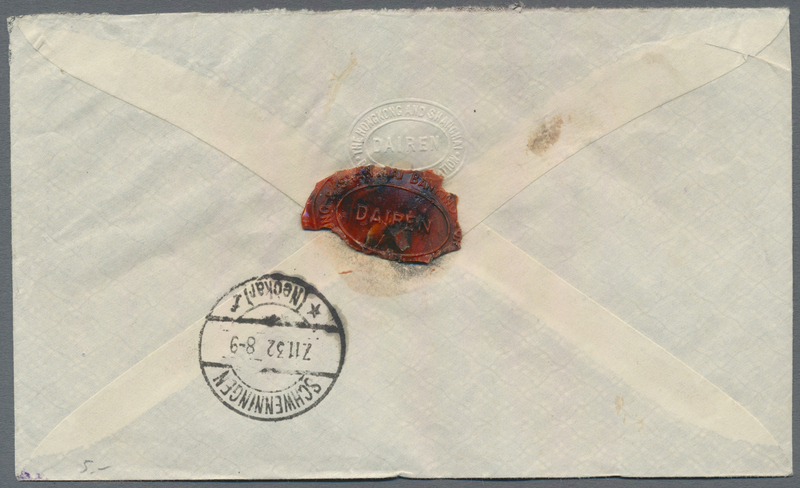 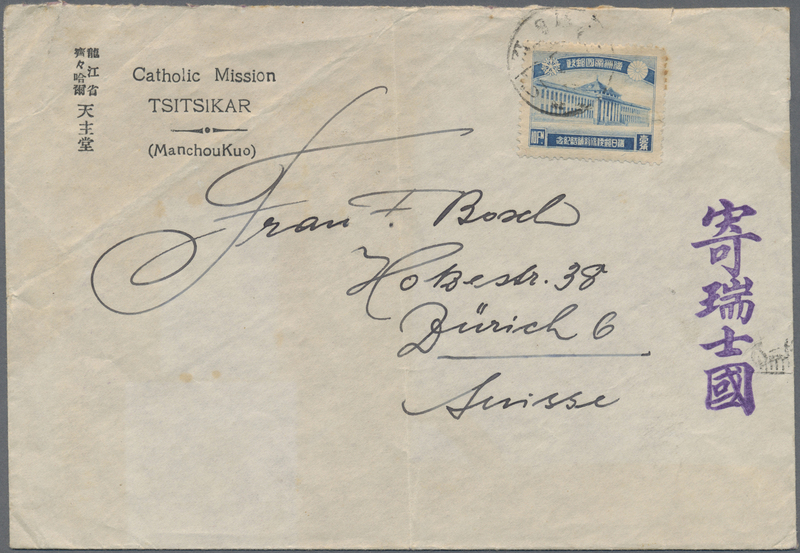 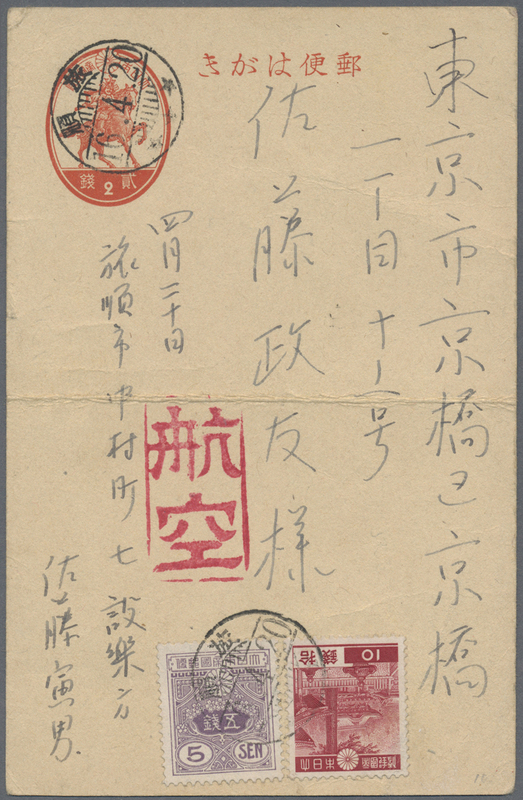 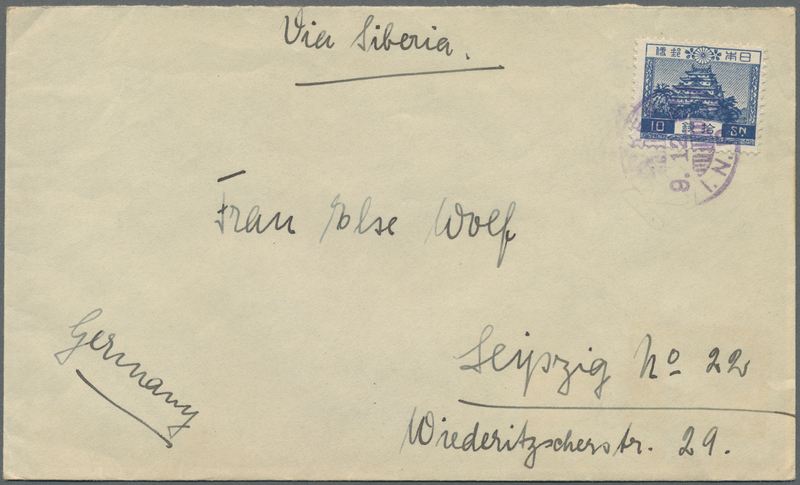 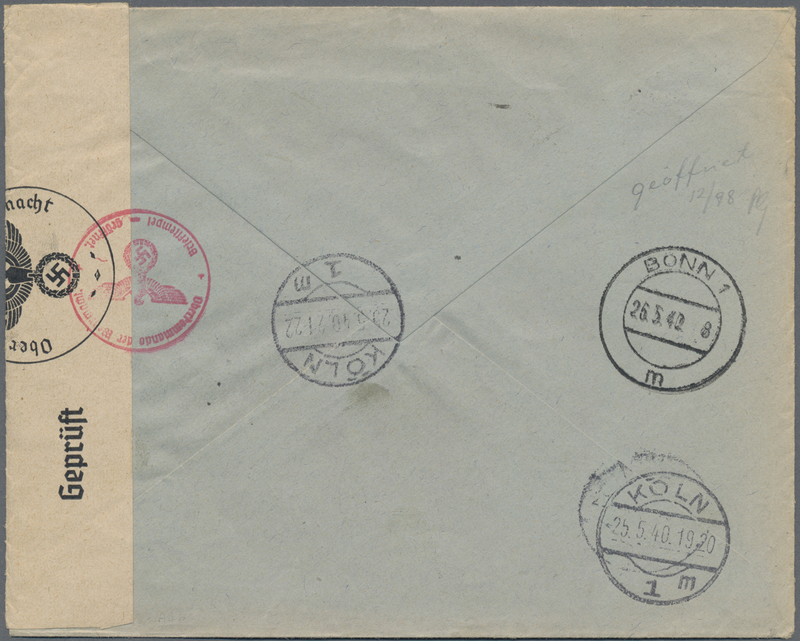 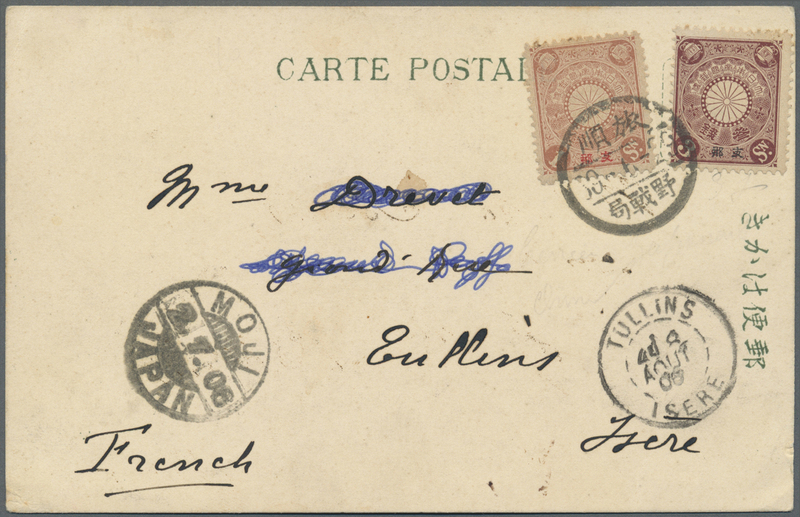 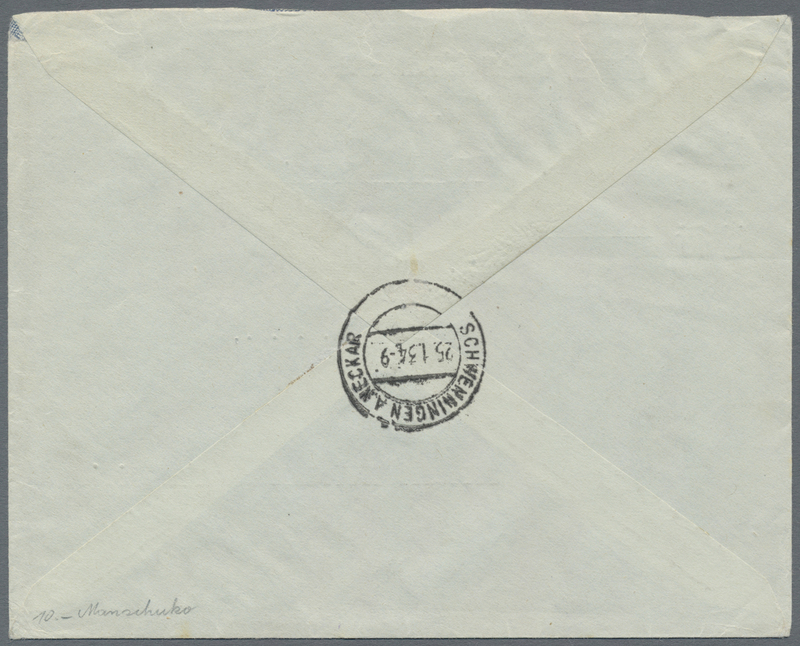 series 1927, junk 10 C. (3), reaper 50 C. tied "Hulun (Chailaer) 24.7.32" (already under Manchuko postal service, use-up) to registered cover via Siberia to Oslo/Norway w. Aug. 6 backstamp, rare. 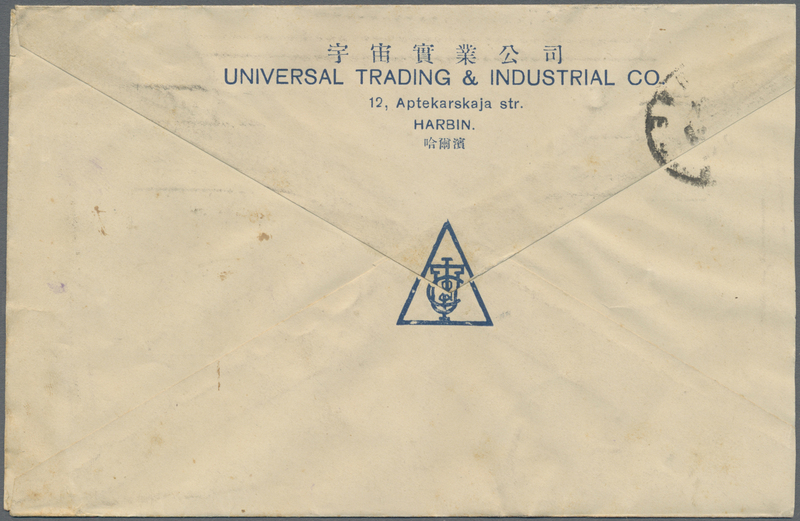 9367 Brief (cover) 83, 86 etc. 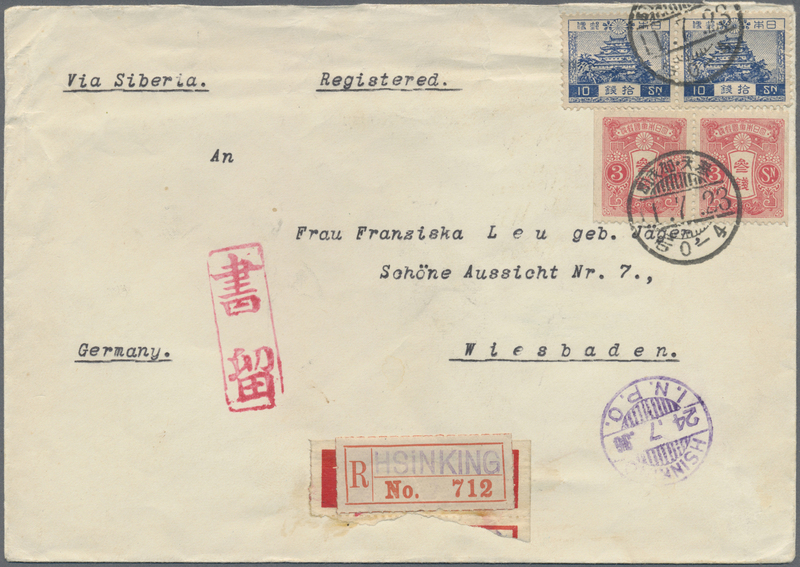 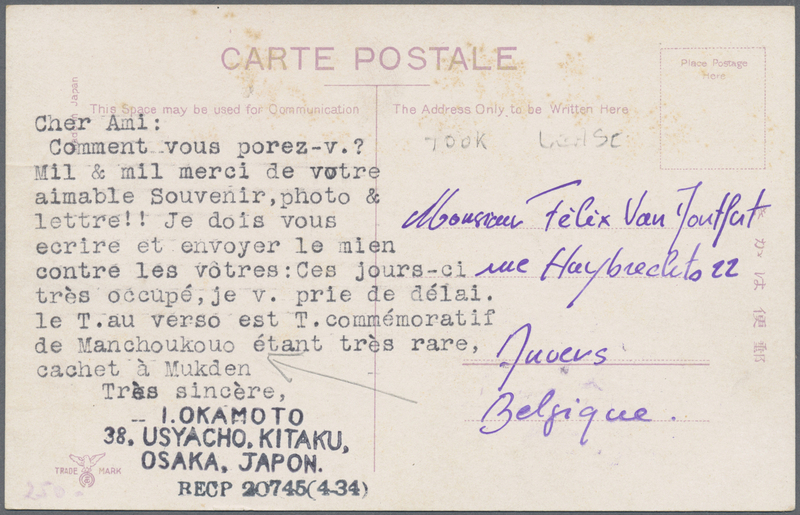 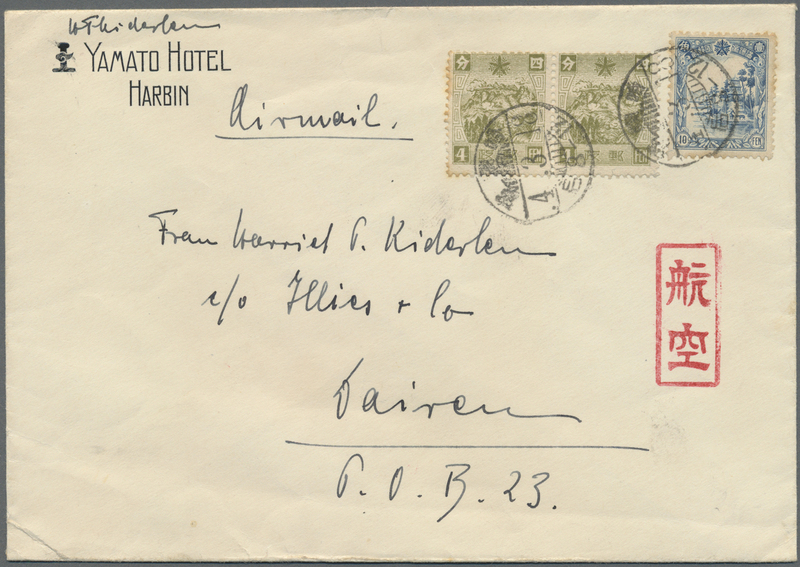 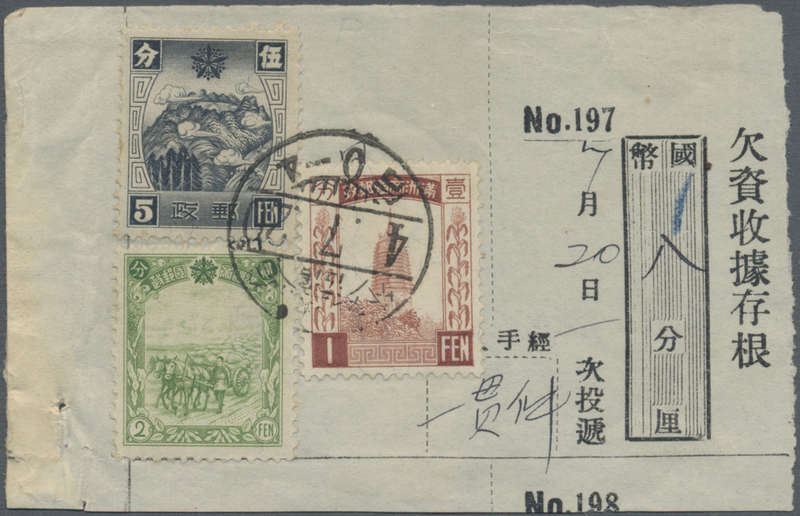 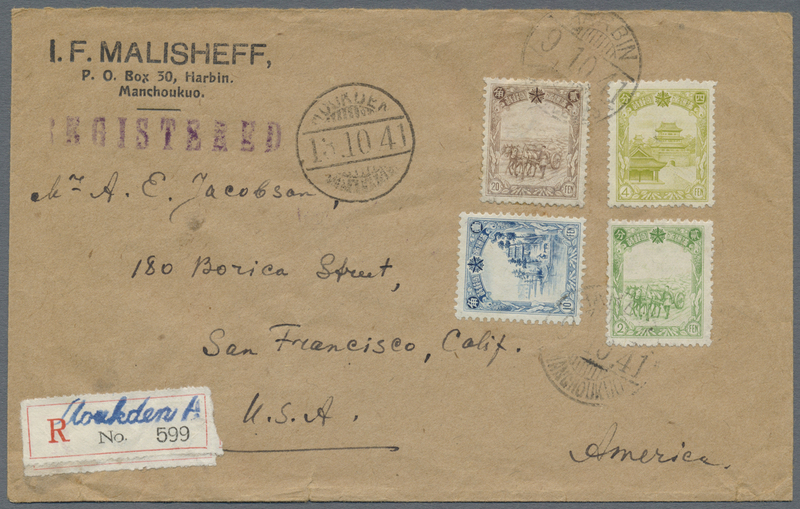 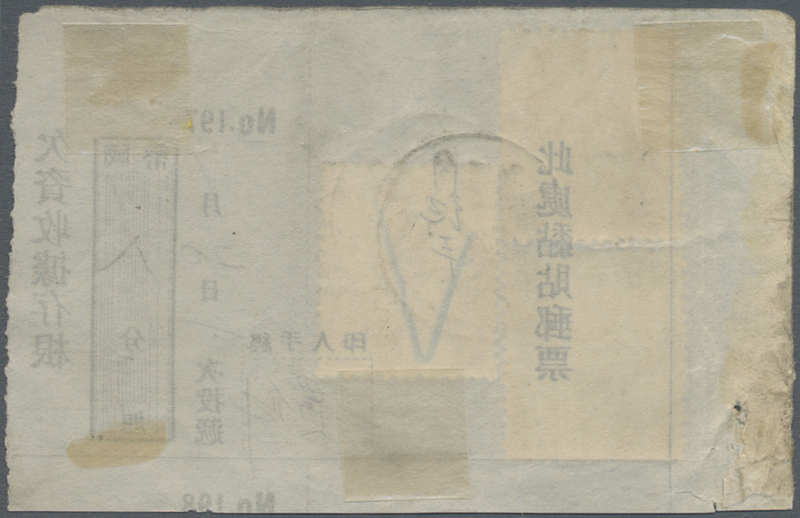 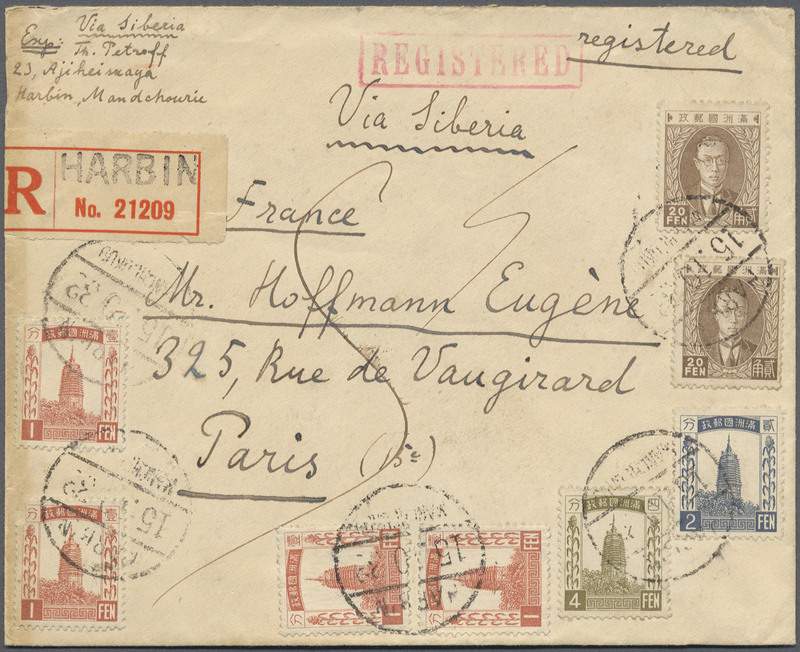 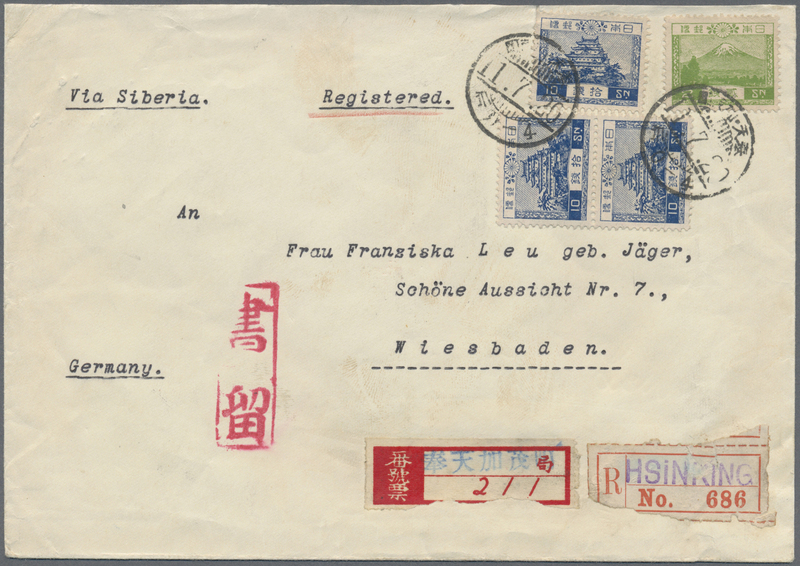 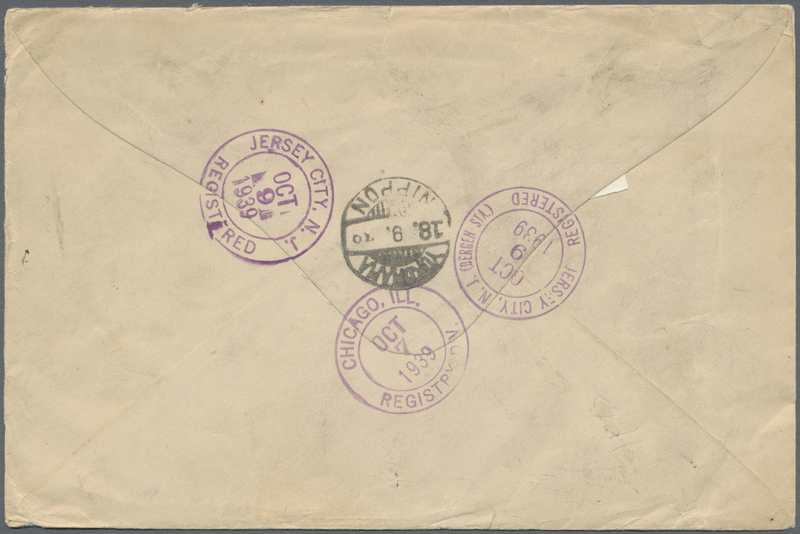 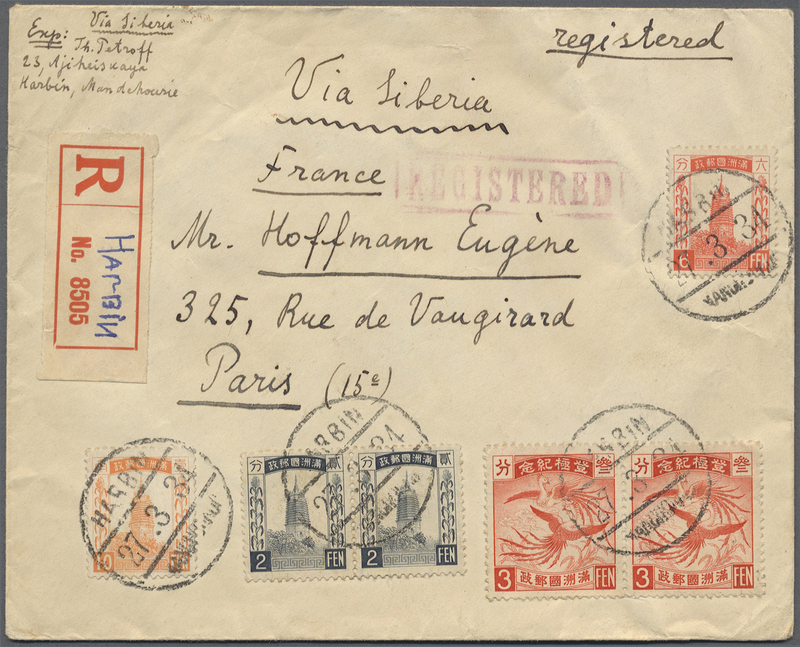 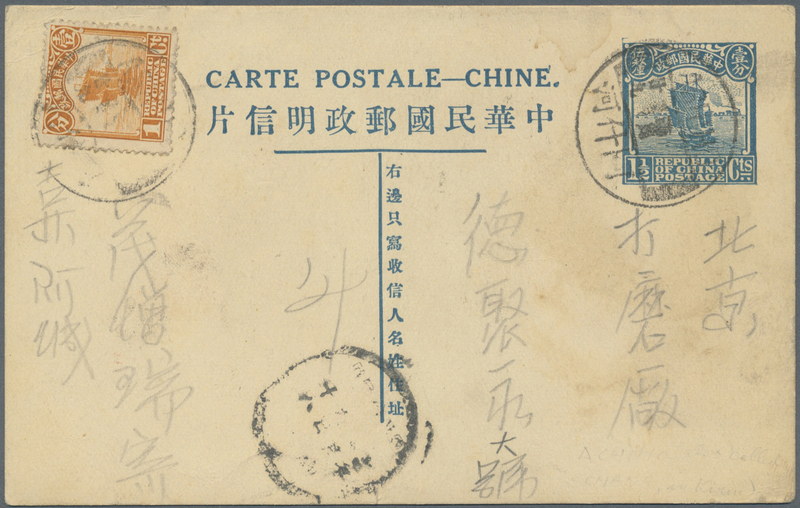 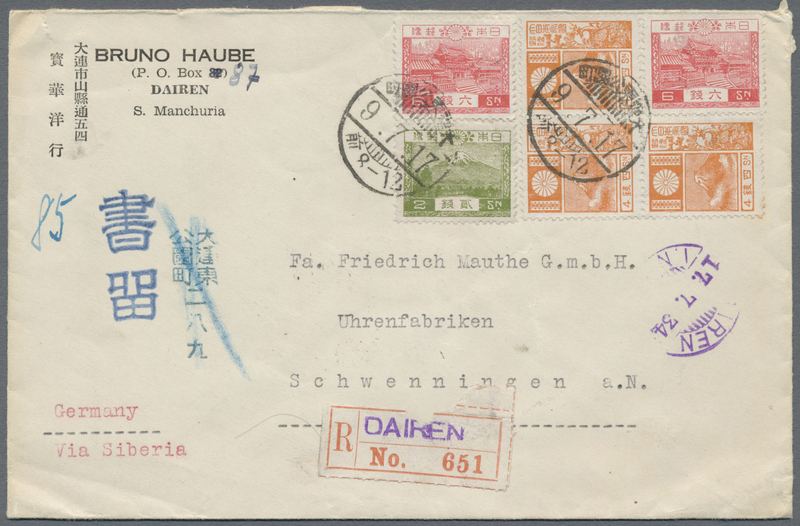 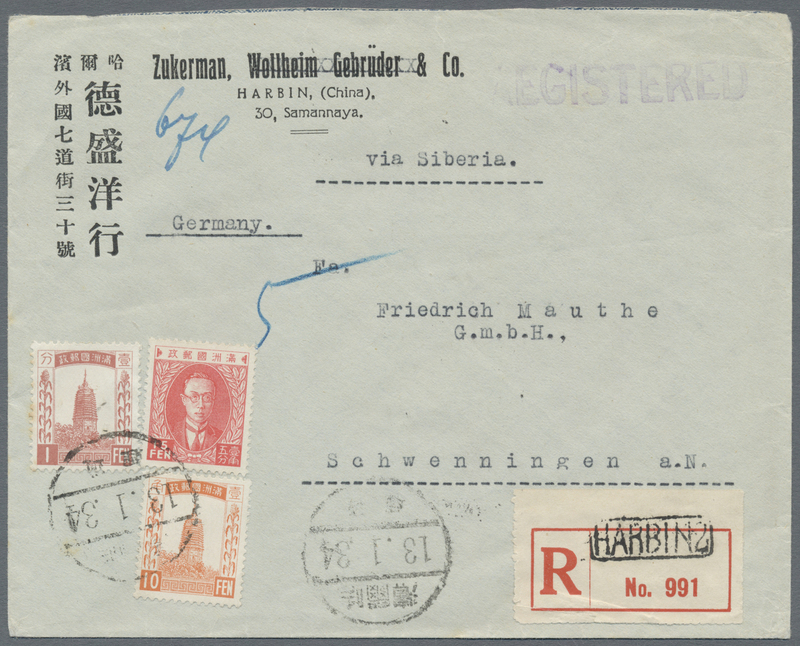 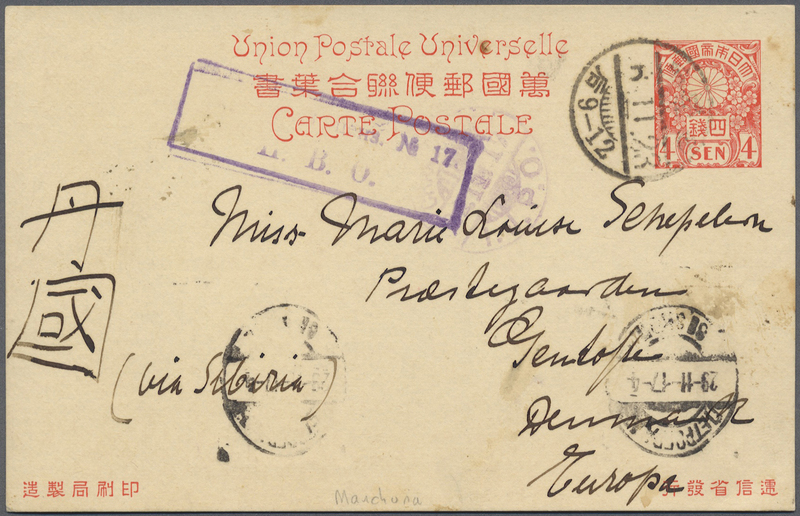 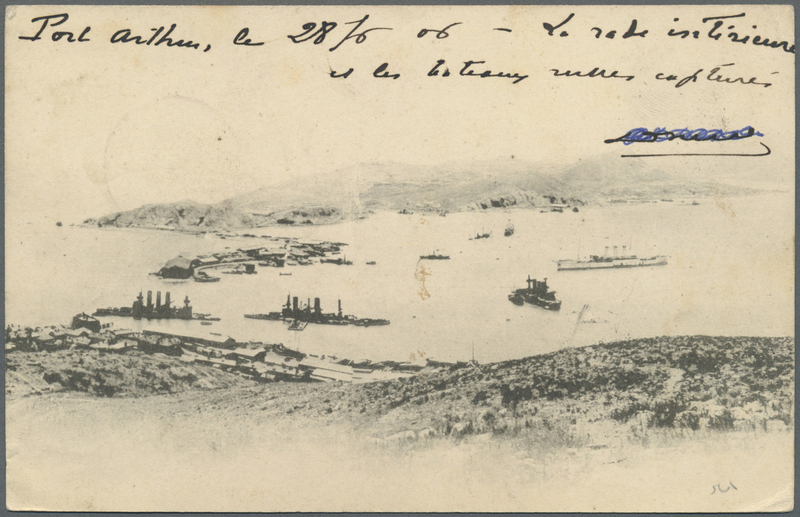 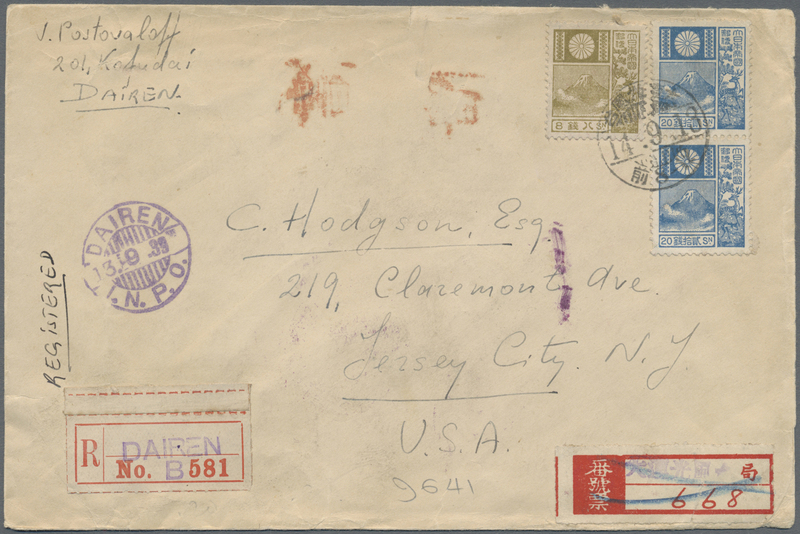 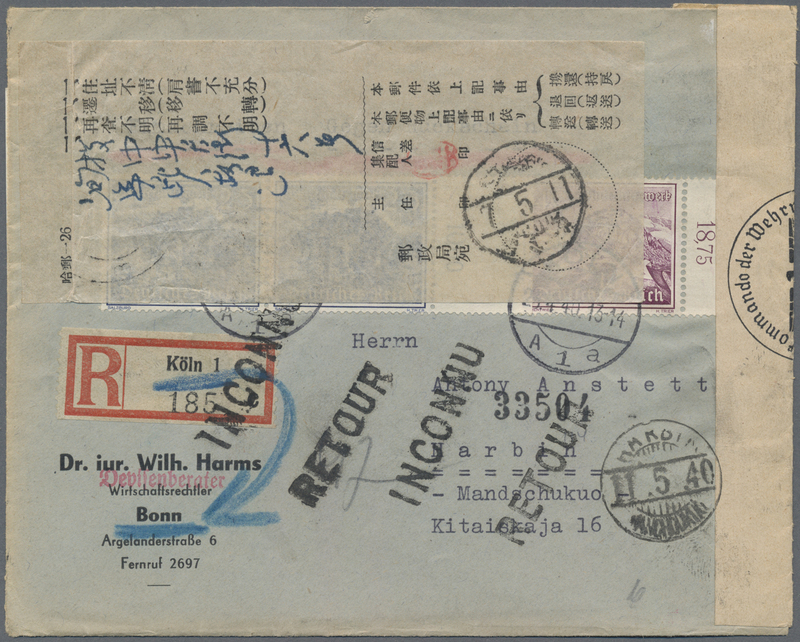 1941, 2 f., 4 f., 10 f. and 20 f. tied "HARBIN 9.10.41" tied to registered cover via "MOUKDEN 13.10.41" to USA, on reverse SF Nov. 12/13 arrivals. 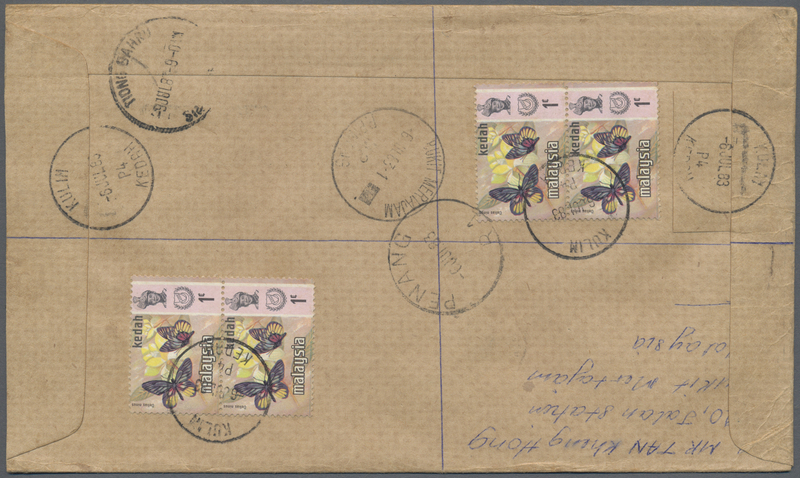 One of the latest covers to the US which actually went through.